Our final stop in Georgia was the once thriving southern spa town of Borjomi, famous for its warm and fizzy restorative mineral waters as well as being the gateway to the Borjomi-Kharagauli National Park. Sadly we didn’t have time for the latter as we’d planned to spend most of our penultimate day exploring the nearby cave monastery of Vardzia. 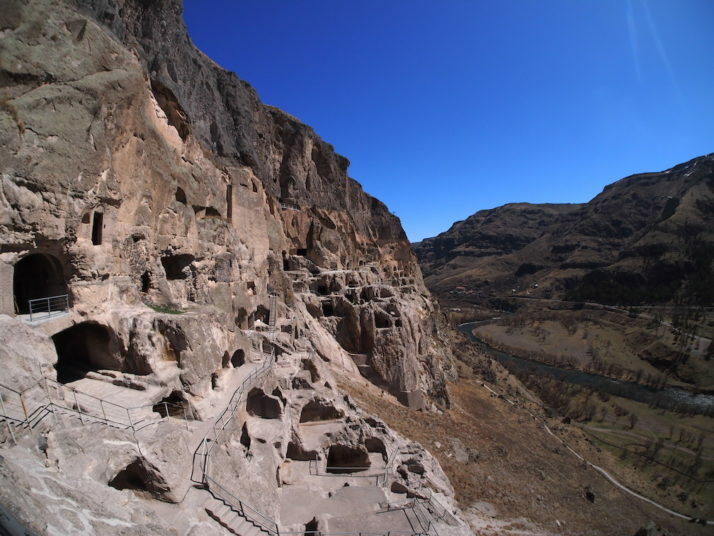 Although excavations show the area has been inhabited since the Bronze Age, with cave settlements starting around the 5th century BC, the remains at Vardzia date back to the reign of King Giorgi III in the 12th century and continued in phases for the next 100 years or so. 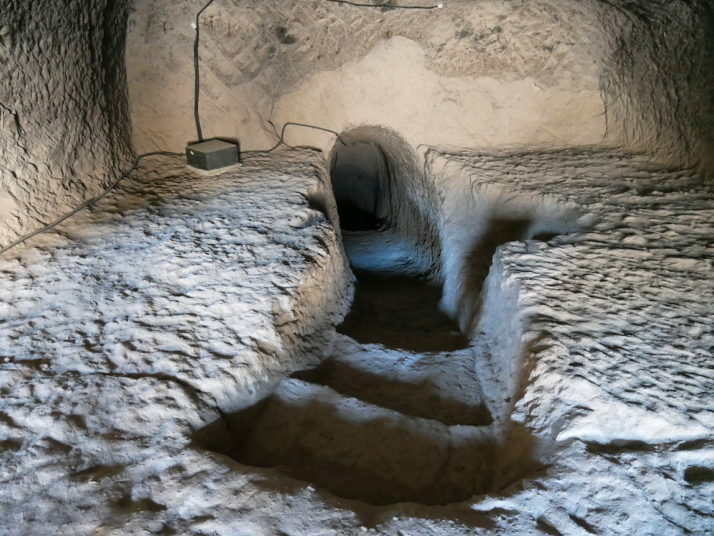 They’re still excavating and adding caves to the site as they’re being restored. Look at all of those caves.. it’s immense! We’d read the guides rarely speak English so we opted for the cheap audioguide (quick tip – they provide a set of headphones but bring extra ones and a splitter to share – you’ll hear it better too, and don’t forget some ID to leave as a deposit) which was great for the history and context but we felt went into a little too much detail about some of the rooms and frescoes. 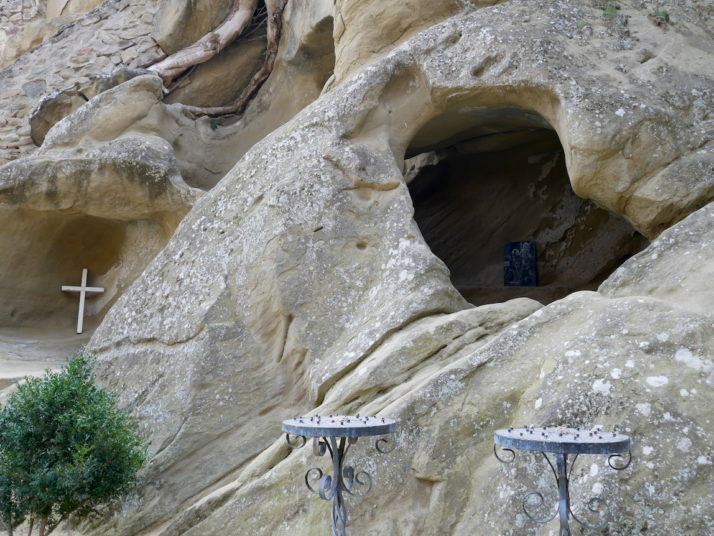 The cave complex is centred around the very impressive Church of the Assumption which is set back into the cliff face, saving it from the earthquake of 1283 that destroyed the outer tunnel network and exposed a lot of the caves to the open air. I say it’s impressive but we weren’t able to see inside for ourselves despite hovering around another couple who were with a guide who had a set of keys on him. 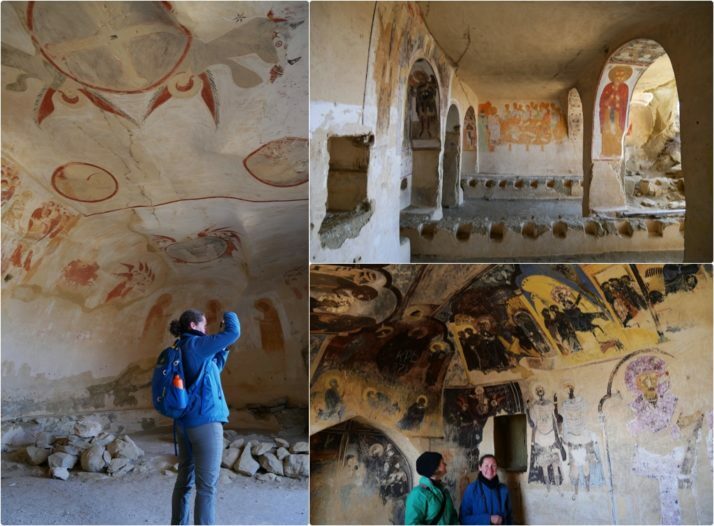 I suspect that it was being renovated ahead of the main tourist season as we could see a lot of scaffolding inside through the cracks in the doors, so we made do with the overly detailed audioguide, recollections of our research, and photographing the frescoes on the outside! Had it not been locked, the Church of Assumption would likely have been the highlight of an altogether astounding visit, pipping it to first prize therefore goes to The Refuge, a secret chamber accessed through a narrow, dark 150m tunnel complete with defences that winds its way from chambers behind the church up through the rock. We really enjoyed our time exploring the multiple levels and variety of caves. Taking our time and taking lots of photos we found it was just the right length. Before heading back to Borjomi we picked one of the on-site restaurants for a bite to eat and were pleasantly surprised at the quality and the price compared to similar captive audience establishments back home. We’d had a similar experience at the Prometheus Cave just outside Kutaisi too. Even stopping for 10 minutes at the Khertvisi Fortress for a quick photo opportunity and to stretch our legs on the way back to Borjomi, we had time to dust off our clothes from scrambling around the caves and tunnels and head to the Mineral Water Park for one last hike in this beautiful country. 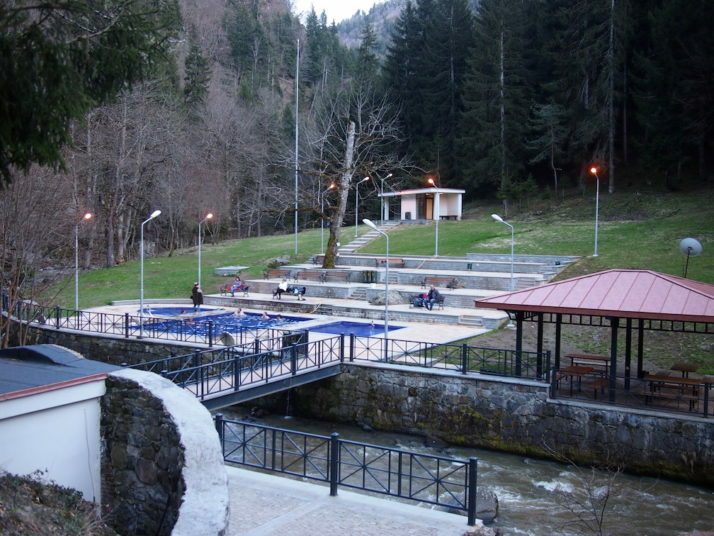 Borjomi’s central Mineral Water Park is on the site of the first spring (which is named Ekaterina), and contains the original bottling plant which looks like it was gearing up to be a museum. We filled our bottles and weren’t too put off by the sulphuric smell, or the fizzy, salty taste. Refuelled for our hike we took yet another cable car to the top of the park and followed the 3km forest trail back down. Filling up with Borjomi’s biggest export – there are some 40 bottling factories in the area and the waters are exported throughout Georgia. Truth be told, we drank about half a bottle between us as the taste was pretty strong! 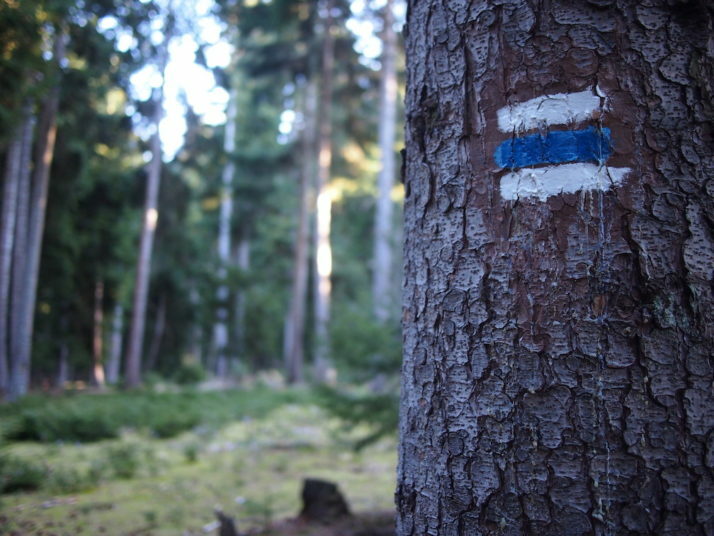 Though the trail was marked, spotting the markers was tricky at times as new barbed wire fences had gone up right across the path! 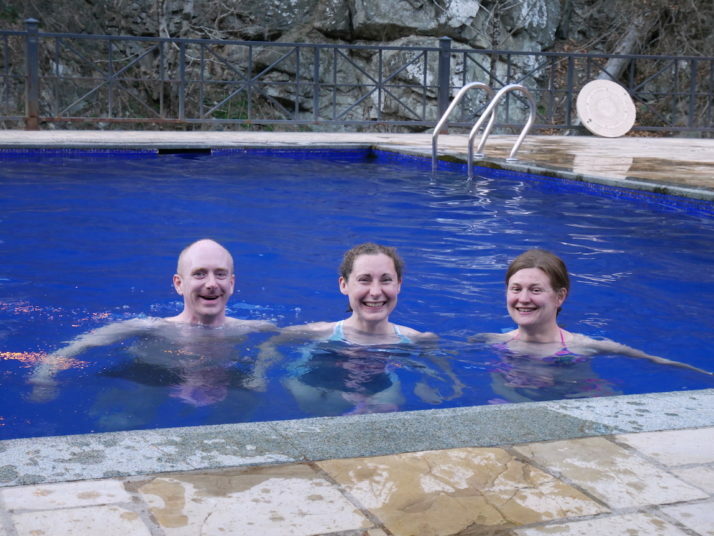 Near the end of the trail are public open-air mineral water swimming pools, time for a dip..
Good thing we’d brought our swimming costumes! The water wasn’t as warm as we’d hoped, and the changing room block was closed so we did the wrap-around towel thing but it was a perfect end to an amazing day and a relaxing end to our time in Georgia. This entry was posted in Places and tagged Borjomi, Cave, Georgia, Hiking, Monastery, Vardzia on June 12, 2017 by Andrew. 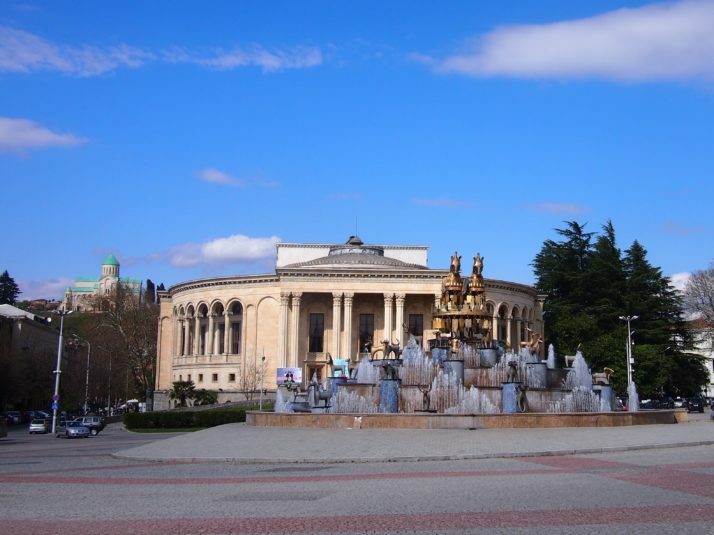 Kutaisi is the second largest city in Georgia though much smaller than the capital Tbilisi. It has a relaxed, friendly vibe and we really liked the central area with its bustling park, elaborate fountain and excellent market. There are plenty of interesting sites within day trip distance too, so in order to do them justice as well as reach a few other places in central Georgia we hired a car for our final week. 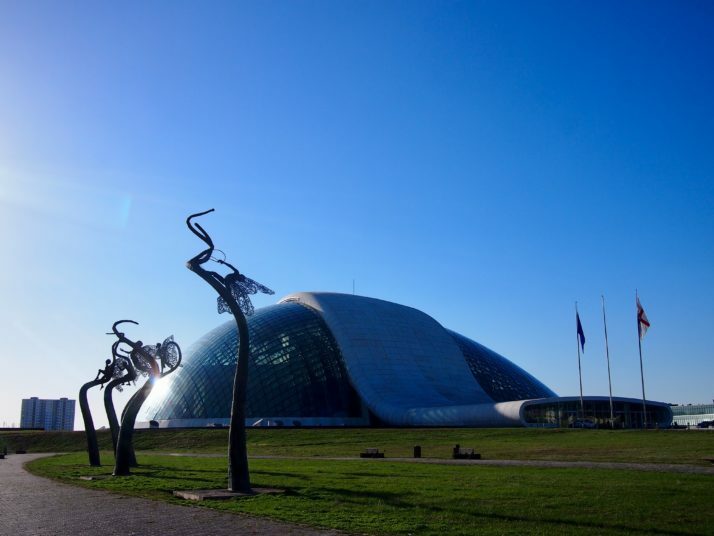 The Georgian Parliament was moved from Tbilisi to Kutaisi by the government of Mikheil Saakashvili to decentralise power from the capital and boost economically deprived Kutaisi. The futuristic building was opened in 2012. Tours inside need to be booked in advance so we just parked up and had a look around outside. 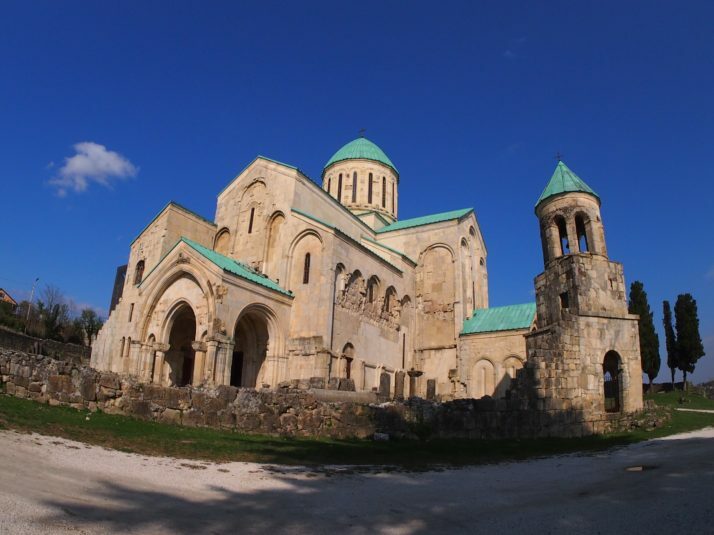 On a hill overlooking the city centre stands Bagrati Cathedral, one of two UNESCO listed sites close to Kutaisi. The pale stone walls and green roof have been pretty much completely rebuilt after lying in ruins since 1692 when it was destroyed by the Ottomans. 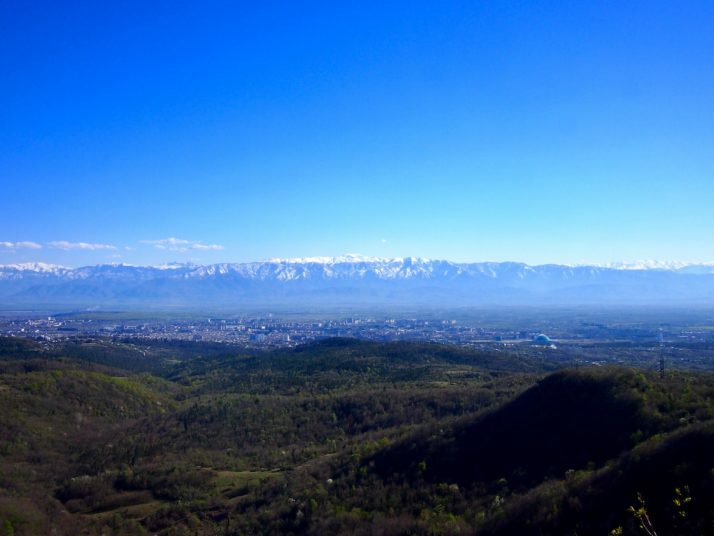 The grounds around it and the view over the city to the Lesser Caucasus mountains are beautiful but we found it rather staid inside. 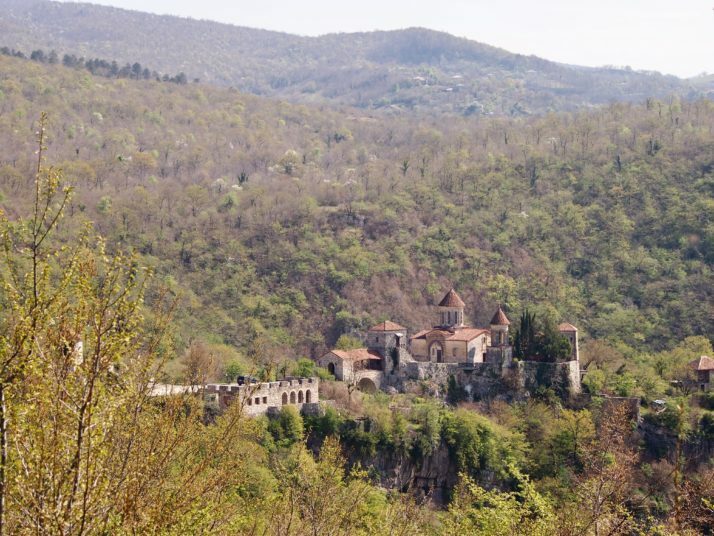 Under the same UNESCO World Heritage listing as the Bagrati Cathedral is Gelati Monastery, just a 20 minute drive into the hills to the north-east of Kutaisi. We found this much more interesting, from the old monk poking about in the engine of his equally aged car just inside the entrance to the stunning frescoed interior of the main church. 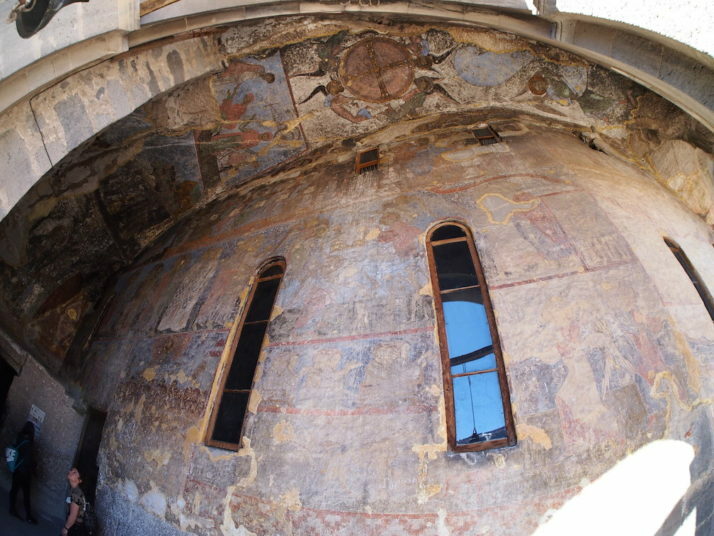 The monastery was founded in 1106 by King David the Builder (guess what he was famous for!) 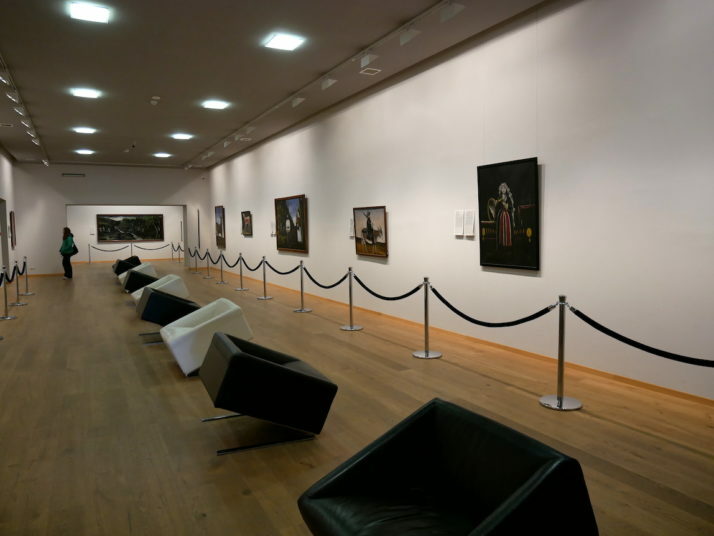 as a centre of culture and learning and it retained that reputation until the communists arrived in the 1920s. King David the Builder wanted to be buried in one of the monastery gates so that visitors would have to step on him to enter the complex. The gate is now permanently closed for passing through and today’s visitors take care to not step on the gravestone! Just down the hill from Gelati is the tiny Motsameta Monastery. 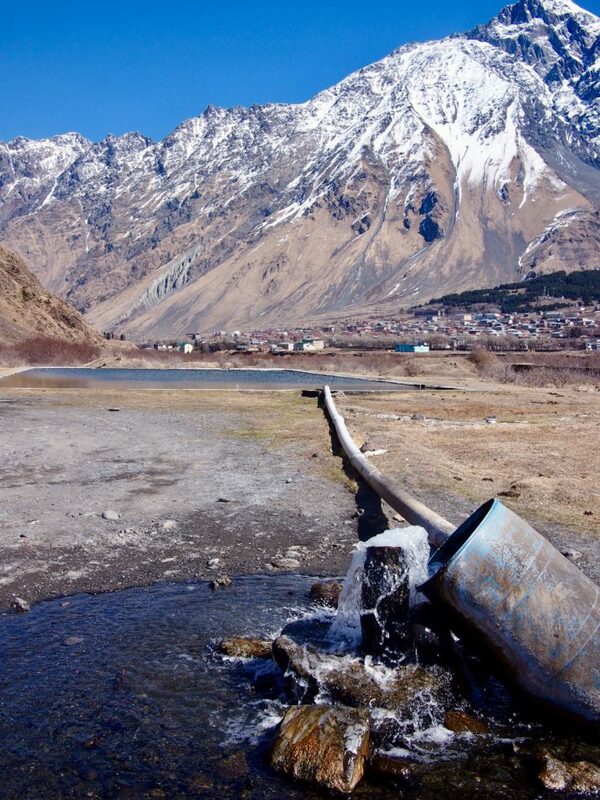 Even by Georgian standards its location is spectacular. 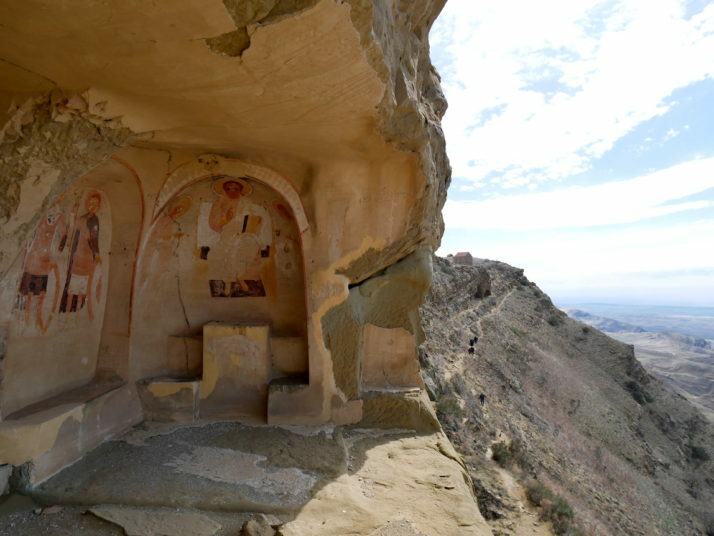 The church is home to the tomb of two brothers who were killed during an 8th century massacre by the Arabs and who were miraculously carried up to the monastery site by lions. The faithful believe that their tomb grants wishes. 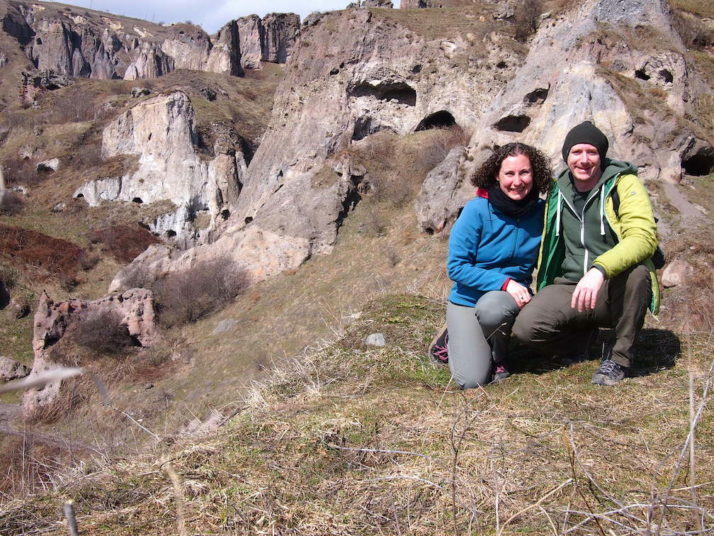 As a break from the churches and monasteries we headed out to see the natural beauty of the area north of Kutaisi. Our first destination was the walkway along Okatse Canyon. Unfortunately I can’t tell you much about it as our GPS directed us onto a rough unsurfaced road which was bad enough, but by the time we reached the bridge at the bottom of the valley that it expected us to cross we decided to give it up and head on to our next stop instead. The Prometheus Cave is 1.4km long and the concrete walkway passes through six large chambers full of impressive stalactites and stalagmites. Entry is by guided tour only and we ended up with a Russian group rather than waiting over an hour for an English-speaking one. In the end that was probably better as we didn’t feel obliged to keep up to hear what the guide was saying and just hung back taking photos! Our Lonely Planet describes the lighting in the cave as ‘discreet’, the word I would use is lurid, but I suppose it creates some interesting effects on the rock formations. I found the Vivaldi background music less offensive as it served to dampen the echoes from the large group. 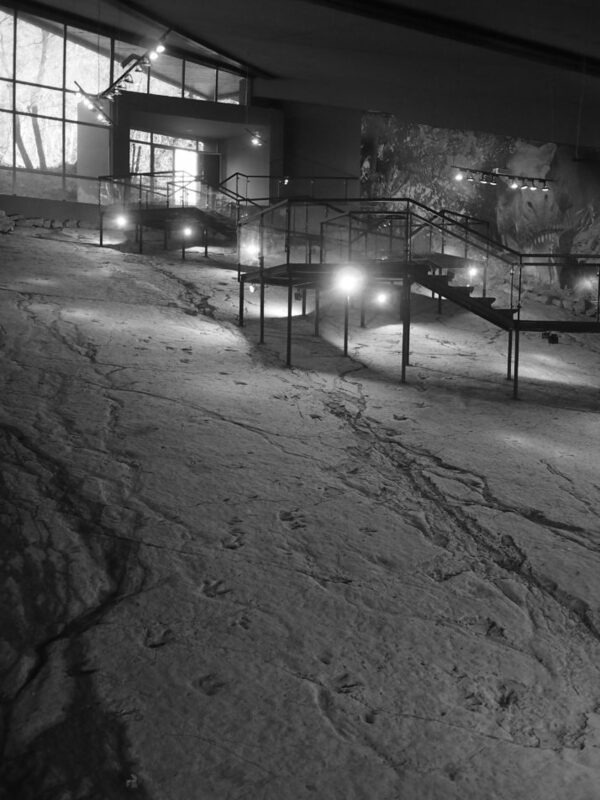 Our final stop of the day was at the Sataplia Nature Reserve, an area of sub-tropical Colchic forest, home to birds, wildlife, and fossilised dinosaur footprints! 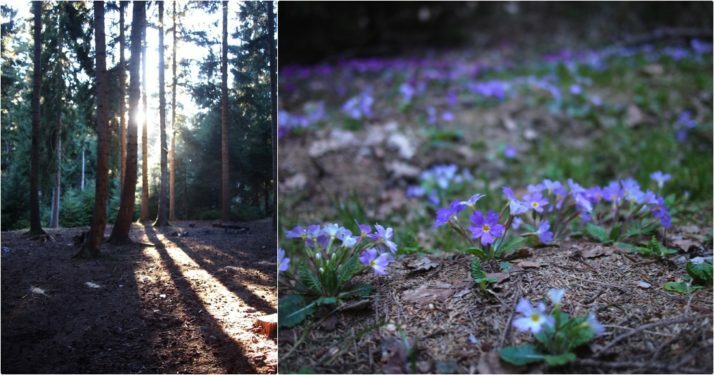 Spring flowers were beginning to bloom on the forest floor and with the sun shining it was a very pleasant walk along the trail to the Sataplia Cave, which honestly was not particularly impressive after the Prometheus Cave. 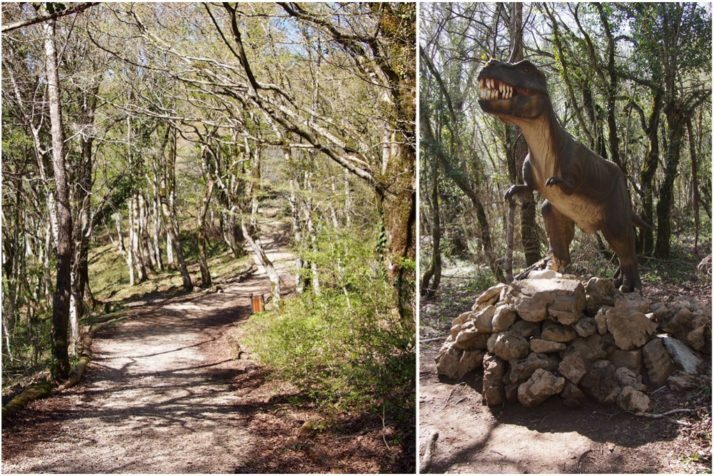 Sataplia Nature Reserve: one minute you’re walking along a woodland path…the next, dinosaurs! The word Sataplia means ‘place of honey’ and is so called because of the tradition of collecting honey from the bees found in this area. There are a couple of great viewpoints along the trail including a glass floored walkway which reminded us of the glass path that we walked on at Zhangjiajie in China. The one here was closed when we visited but we could get close enough to see the view. 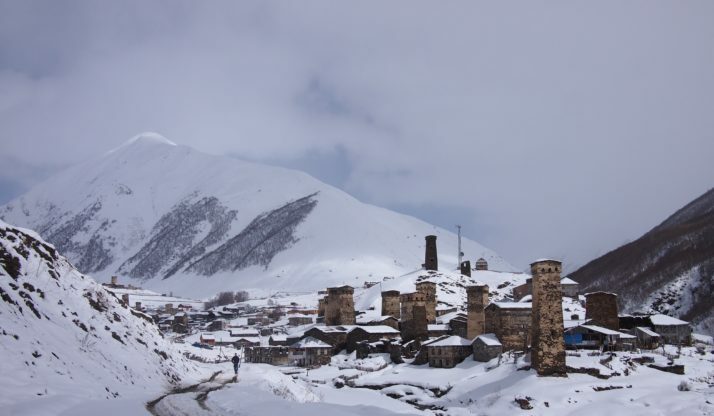 70km east of Kutaisi is the small mining town of Chiatura. 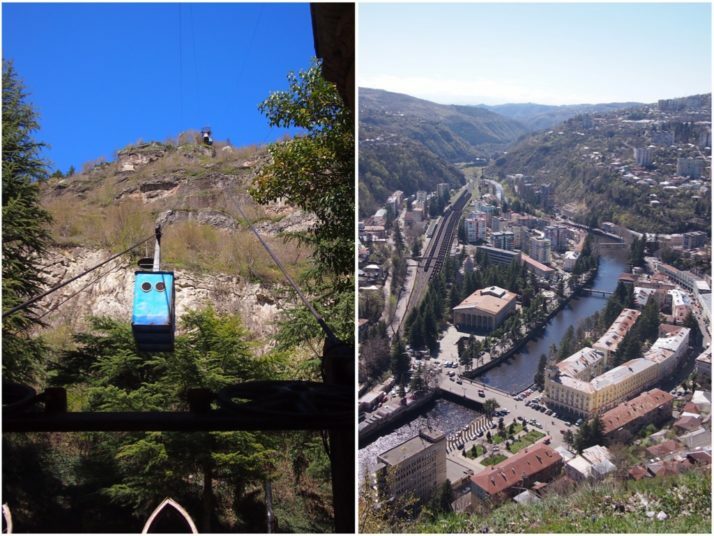 It’s very much off the standard tourist radar but we’d read that there are several still-functioning Soviet era cable cars linking the town centre with the mines and residential areas in the hills above so we stopped off for a brief visit to frighten ourselves with the rickety contraptions. 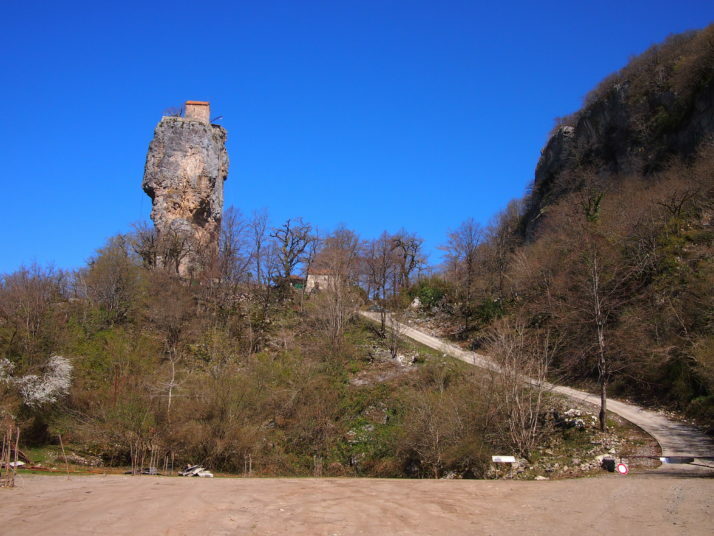 On the way to Chiatura we visited the Katskhi Pillar, a monastery atop a rocky outcrop. Apparently one monk still lives up there! The first cable car we rode had a lady operator who was in charge of locking the door and stopping and starting the system. At the top we seemed to have reached a residential area though we didn’t venture far from the station. That car ran at 15 minute intervals and there was no charge or ticket. On the way down we were sharing with (among others) a chatty old lady who wasn’t going to let her lack of English or our lack of either Georgian or Russian stop her from finding out all about us! 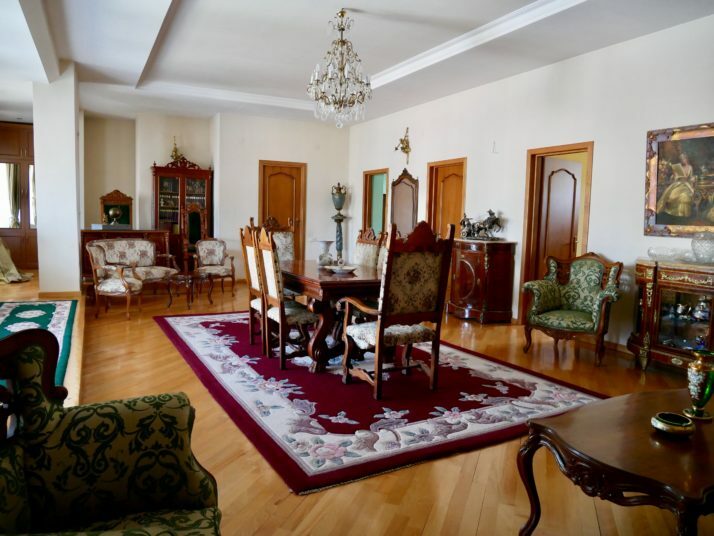 Final mention should go to our rental apartment in Kutaisi. We didn’t quite believe the pictures on the booking website but it really was as grand as it looked! Our rental apartment felt like a stately home! 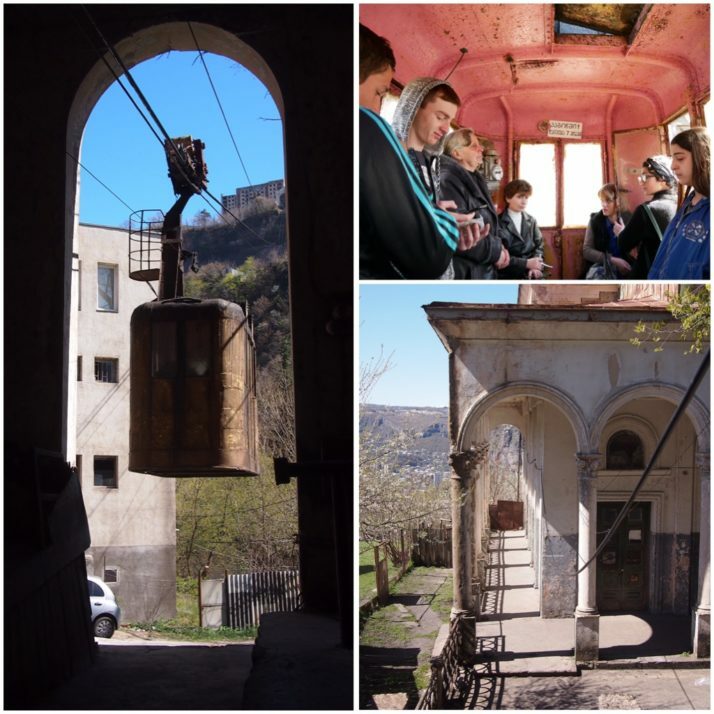 This entry was posted in Places and tagged Cable Car, Cave, Church, Georgia, Kutaisi, Market, Monastery, UNESCO on May 24, 2017 by Julie. Georgia is a mountainous land. There’s a low, flattish strip running from the Black Sea in the west to the Azerbaijan border in the south-east, but everywhere else is high ground with the mighty Caucasus mountains forming the country’s northern border with Russia. Visiting at the end of March we weren’t sure whether the snow would have melted and how accessible the mountains would be but we wanted to try to get to them. From Sighnaghi we returned to Tbilisi and took another marshrutka along the Georgian Military Highway to Stepantsminda, also known as Kazbegi. This small town is home to one of the most famous views in the country and if you look at any tourism material about Georgia you’ll almost certainly see a picture of the small monastery perched on a ridge with a towering mountain behind it. We’d booked rooms in a guesthouse before arriving, saw that it was marked on our offline map and confidently struck out from the bus stop in the centre of town for what looked to be about a five minute walk. View from our guesthouse, Homestay Lela and Mari. 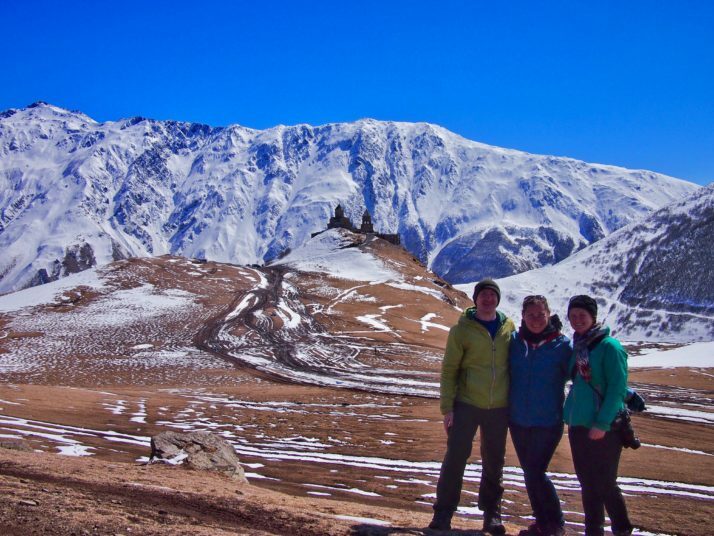 We originally thought that Mt Kazbek was the snowy section to the right of the monastery, and then we saw the peak poking out from the clouds above! Suffice to say, the guesthouse wasn’t where the map said, and after knocking on the door of a random lady, walking up and down the street for 20 minutes, bothering several other passersby and three phone calls to the guesthouse who spoke limited English, we were a little nervous about all the trouble we’d caused when our host Gela pulled up next to us in his car. No need to worry! He brushed off our apologies, drove 30 seconds to the house (just round the corner from where the map said it was), presented us with plates full of biscuits and sweets and offered us coffee or tea. We gratefully accepted a coffee and he confidently added ‘chacha?’ Not wishing to be rude we tentatively accepted a glass of the local firewater, distilled from the second pressing of the grapes, which with Gela’s hospitality swiftly became three and then five shots so that when we later set out to explore the town we were all a little giggly! The following morning I woke quite early, peeped around the curtain to see what the weather was like and my jaw dropped. Mt Kazbek had emerged from the clouds and the pink light of the sunrise was making its way down the peak towards the Gergeti monastery. We oohed and aahed, taking lots of (almost identical) photos until Gela bundled us all into the car and we sped off up the hill. We weren’t entirely clear on where we were going but shortly arrived at a small monastery above the town opposite Mt Kazbek. 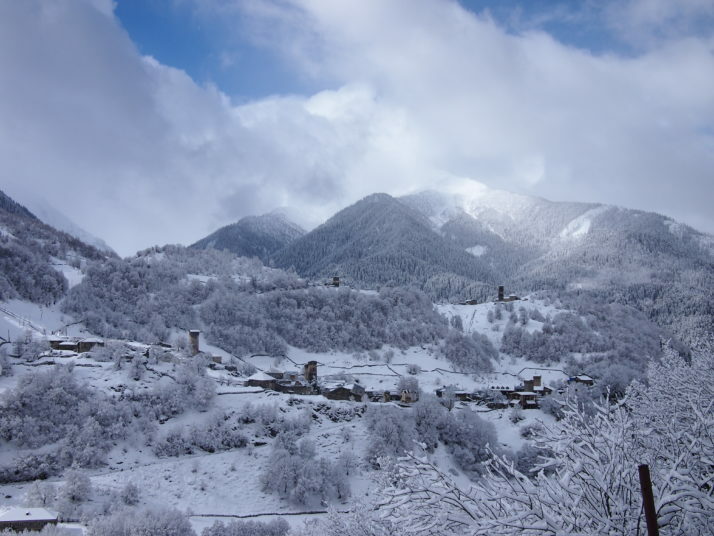 As we got out of the car we saw a young monk hurrying across the snow covered grounds to ring the bell and a few minutes later we were standing at the back of the tiny colourfully frescoed church listening to the monks’ morning prayer chants. Gela gave us each a candle to light and place in front of one of the icons and I said a small thank you to the world for such a magical start to the day. 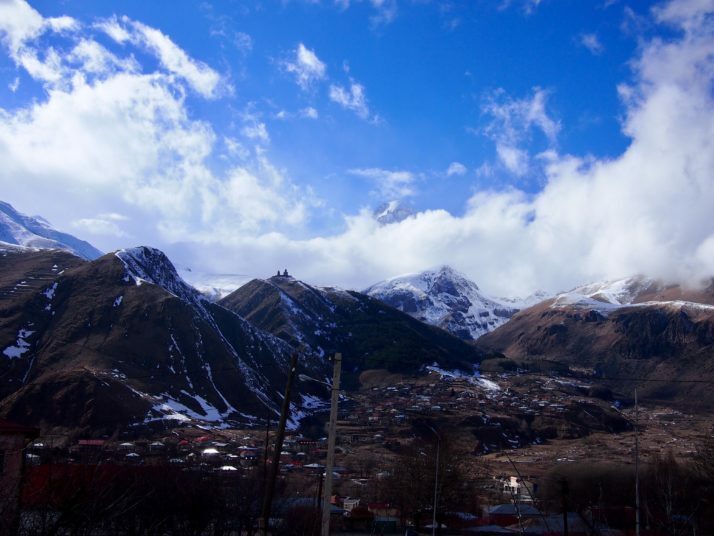 On our second morning in Kazbegi, Andrew got his camera set up to take a time-lapse of the sunrise. After breakfast we set off to hike up to the Tsminda Sameba (Holy Trinity) monastery which we’d been admiring from below since the previous afternoon. We refused the many offers of ‘taxi?’ as we walked through the town, crossed the river and passed through the opposite village of Gergeti. The hike was steep but not difficult and with a few pauses to catch our breath admire the spectacular view we made it up to the monastery in about an hour from the valley floor. Having seen no other tourists on the walk up it was a bit of a shock to find several groups armed with selfie sticks spilling out of cars at the monastery. The church itself is small and architecturally nothing special, it’s really the location that counts here. 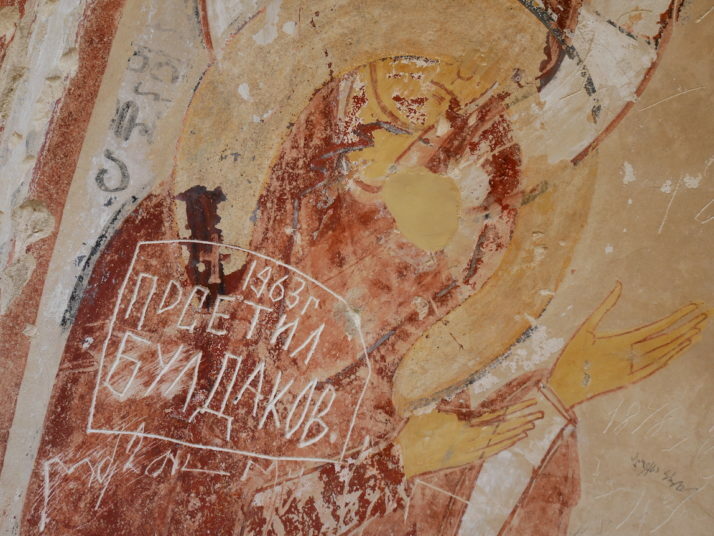 Even historically, when enemies threatened, the Georgians brought their sacred treasures from Mtskheta and put them in the monastery for safe keeping. 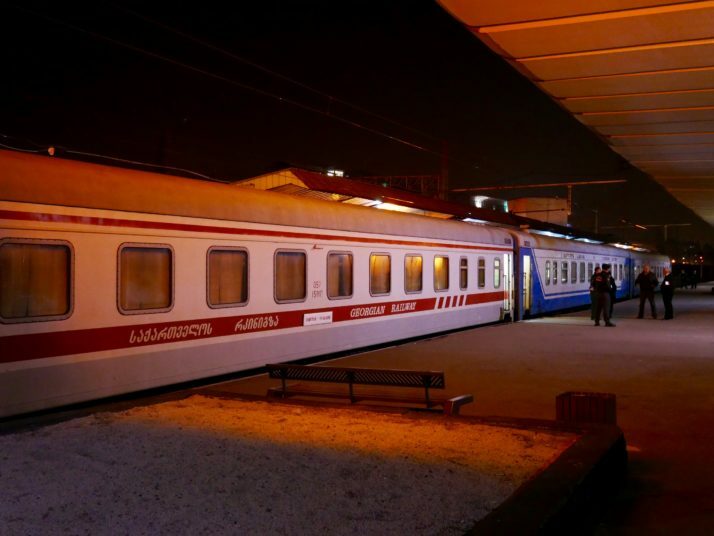 We arrived in Zugdidi in north-western Georgia at 6am after an uncomfortably hot overnight train journey. 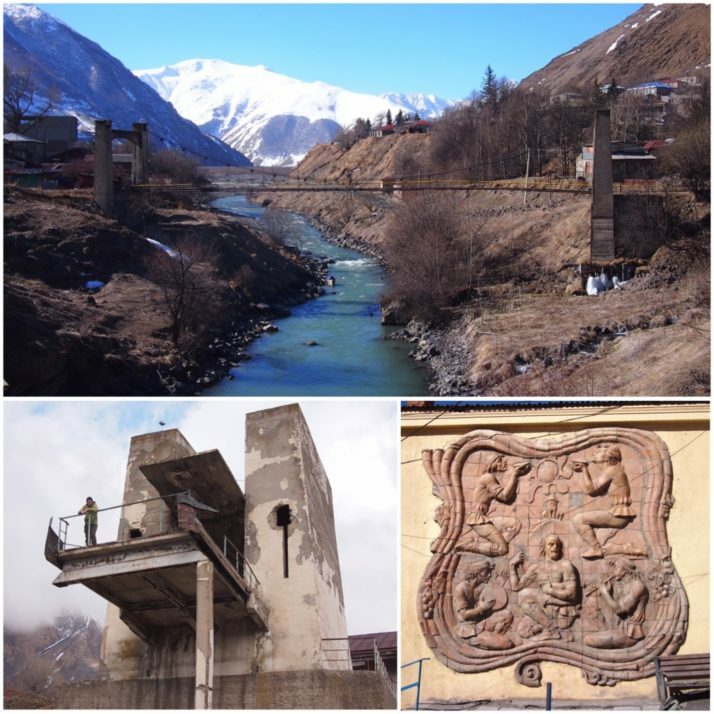 From there it was a three hour marshrutka ride up increasingly twisty roads with increasingly stunning views to Mestia, the main town of the Svaneti region. 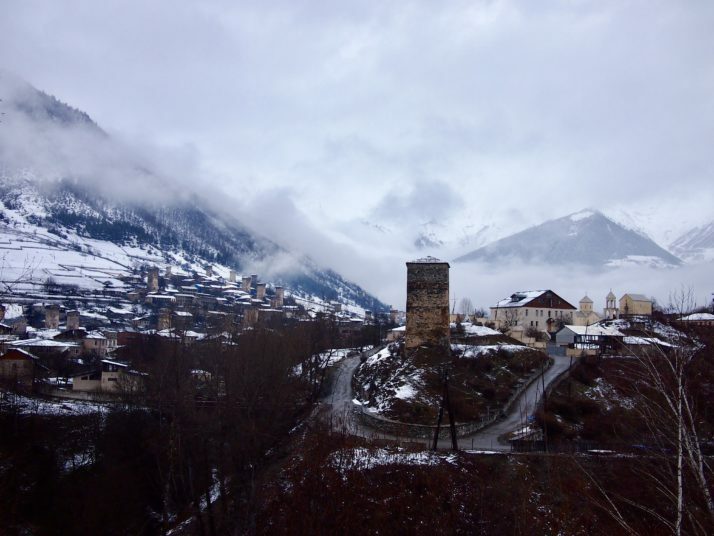 The Svaneti region of the Caucasus has its own distinct culture, food, traditions and even language, and the Svan people are very proud that they’ve never been ruled by outsiders. 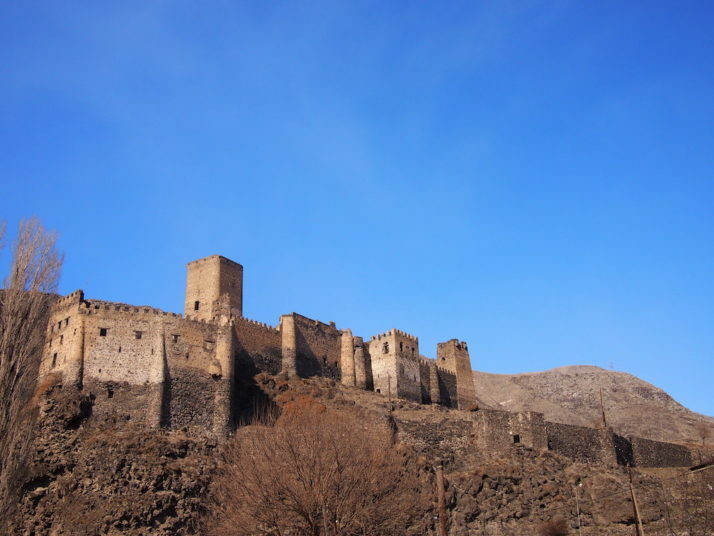 The most obvious and distinctive part of their culture are the defensive towers. 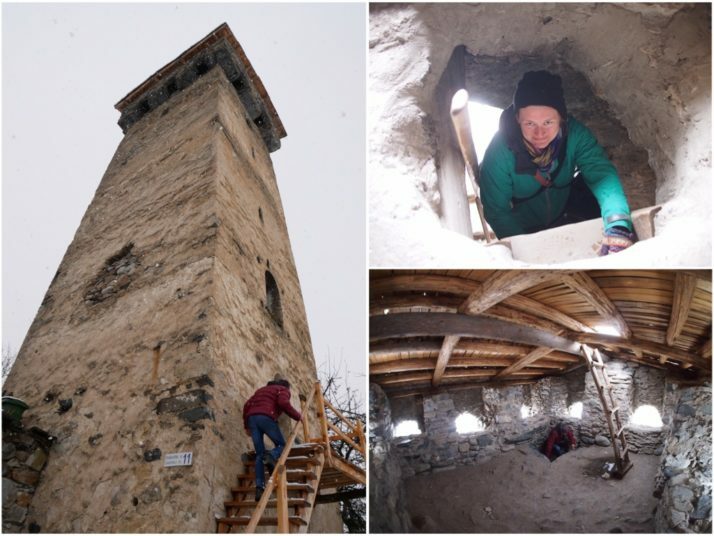 We’d seen an example of a Svan tower at the Ethnographic Museum in Tbilisi but here we were able to go inside and climb up to the top even sticking our head through the roof hatch in one case! 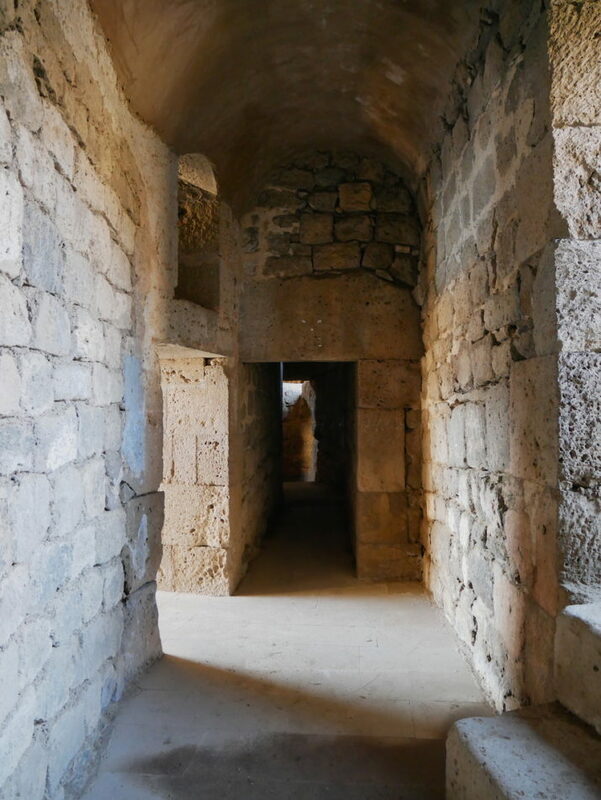 Some levels had stone floors and others wood but each was small and had bare stone walls. The tradition of the towers dates back to the Middle Ages and each family had its own attached to the main living hall to be used for protection of the owners and their animals in case of attack from invaders or raiders. Some of the towers were also used for signalling with fires being lit in a chain down the valley to warn of an impending attack. The excellent museum in Mestia had an exhibit of photographs taken by Italian Vittorio Sella in the 1890s and the town’s architecture is still recognisable 125 years later. 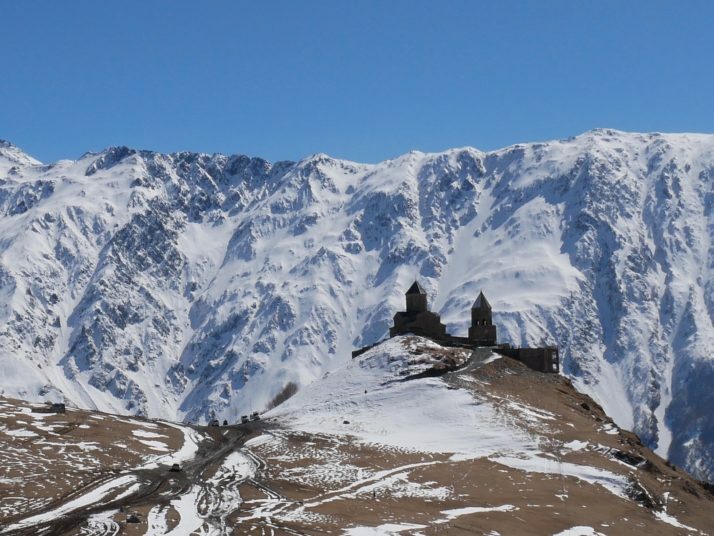 Although Mestia is at roughly the same altitude as Kazbegi, around 1500m, the sunny spring weather that we’d experienced in the eastern mountains didn’t quite seem to have arrived here yet. There was still snow on the ground and on our second day we were more or less snowed in as the fluffy flakes fell continuously from early morning to late evening. 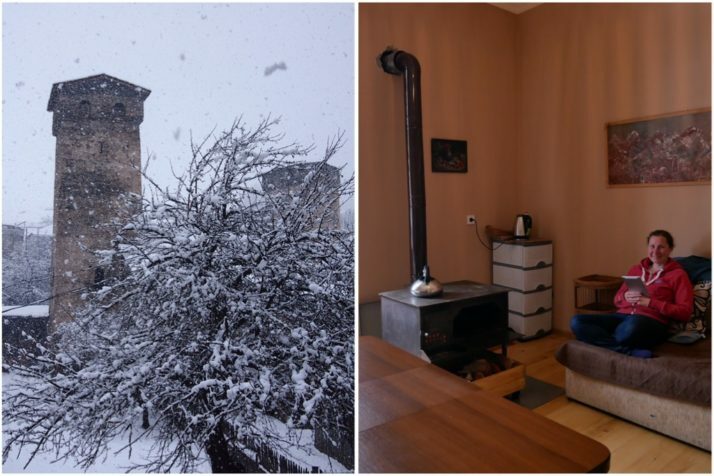 We ventured out for a walk to the cathedral (locked) and for lunch at a local cafe but mostly we just holed up in our guesthouse around the cosy wood burning stove. Fortunately by the following morning the sun had appeared and was starting to lift the clouds from the mountains. 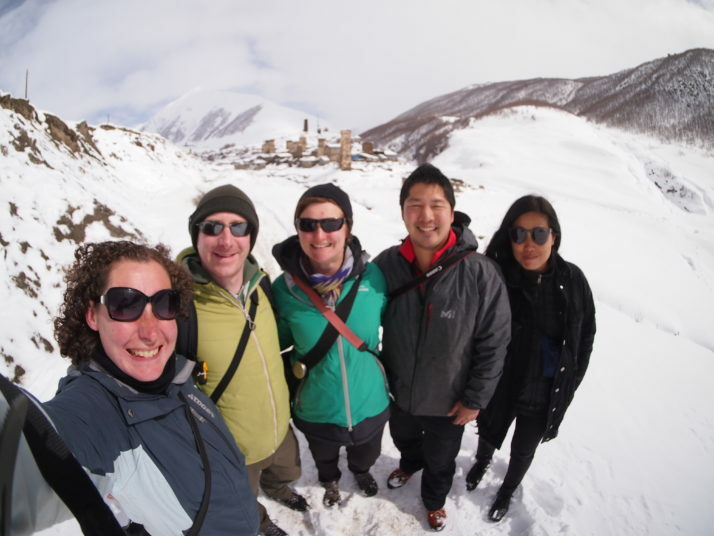 We’d arranged a trip to Ushguli, a UNESCO listed village further into the mountains with Vakho, our guesthouse owner’s brother. Also joining us were a Korean woman and a Japanese man who we’d met in town. 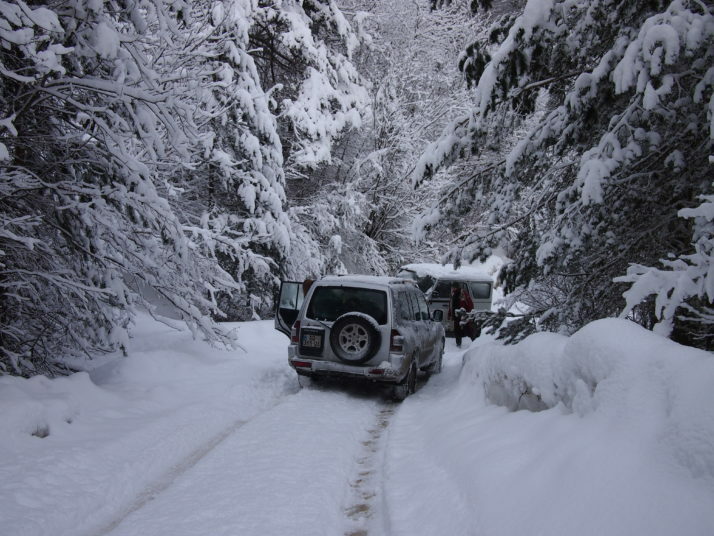 It’s a rough road passable only by 4WD vehicles even in the summer and the 47km (29 miles) takes over 2 hours to drive. We reached a point where no other vehicles had driven and were cruising along downhill when suddenly a Russian made jeep flew around the corner ahead of us. CRUNCH! There was nowhere for us to go and the front corner and headlight unit of our Mitsubishi was caved in by the impact. Luckily no-one was hurt and the engine wasn’t damaged so after a short while we were back on our way though Vakho was understandably upset at the damage which would likely cost him significantly more to fix than the 200GEL that we were paying him for the day’s excursion. There’s no car insurance here and the other vehicle’s owner didn’t seem to be overly concerned about helping out though technically it was his fault as he was driving uphill. 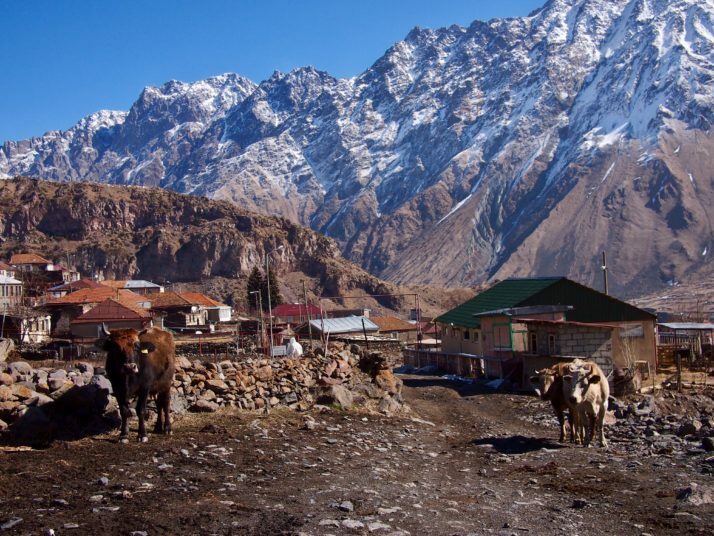 The community of Ushguli stands at the foot of Mt Shkhara, Georgia’s highest peak, and is made up of five villages, one of which was inscribed on the UNESCO World Heritage List in 1996 as an “exceptional example of mountain scenery with medieval-type villages and tower-houses”. 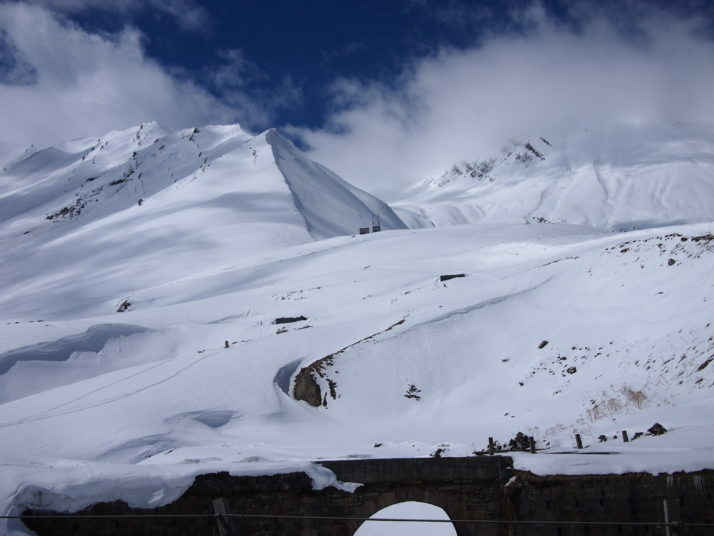 At an altitude of between 2060 and 2200m it also lays claim to being the highest permanently (i.e. year round) inhabited settlement in Europe. It must be a difficult place to live, bitterly cold in the winter (it was bad enough in late March), two hours on a bad road to the nearest small town, and five or more to anything bigger, the people must be hardy and self-sufficient in ways that are difficult for us to imagine. One Svan culinary specialty is the kubdari, similar to the cheese-filled khachapuri found in the rest of Georgia, but stuffed with seasoned meat. 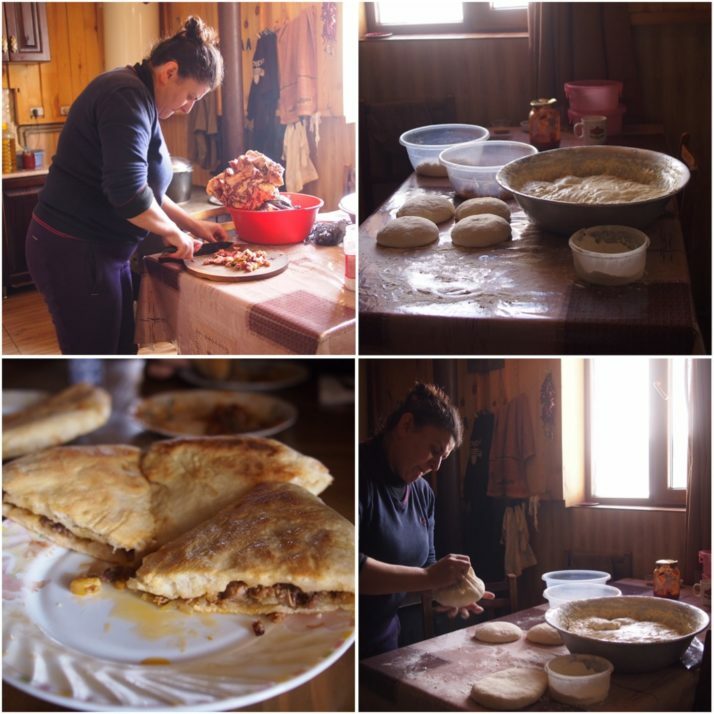 In Ushguli we got an impromptu cooking lesson from a cafe owner as we watched her make pies for our lunch. I suspect that getting the filling to stay neatly inside the dough is not nearly as easy as she made it look. Once made, the kubdari were cooked on top of and then inside the traditional wood-fired stove which is the heart of every Svan home and kitchen. After lunch, Vakho and the cafe owner scrambled the security guard and museum keeper to open the small ethnographic museum up for us. 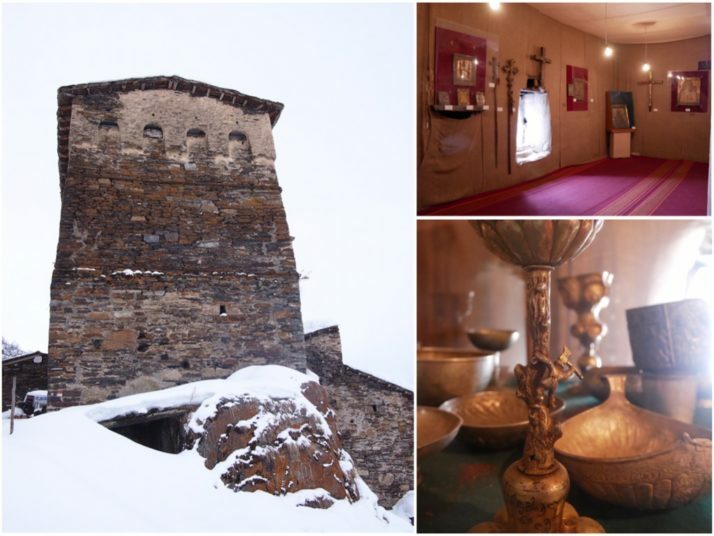 Located in a fat tower in Chazhashi, it houses treasures from Ushguli’s seven churches including gold and silver chalices, icons and crosses as well as jewellery and drinking horns. Emerging from the museum we trudged through the snow a little further along the street when we heard loud barking and saw an enormous Caucasian shepherd dog bearing down on us. A woman shouted at him but we beat a hasty retreat all the same. The dogs in the streets of both Ushguli and Mestia are quite intimidating. Not so bad if it’s a cute waddling sausage dog, but others are descended from the mountain dogs bred to protect the sheep from wolves and bears and could do quite a bit of damage if they felt so inclined. Locals told us that they are generally safe as the dogs have learnt that tourists will give them food but I didn’t enjoy having a pack follow us around especially as we had no intention of feeding them. Feral dogs aside, the mountains were a highlight of the trip for all of us and we vowed to return in the summer for some hiking! This entry was posted in Places and tagged Architecture, Food, Georgia, Hiking, Kazbegi, Mestia, Monastery, Mountains, Svaneti, UNESCO, Ushguli on May 19, 2017 by Julie. 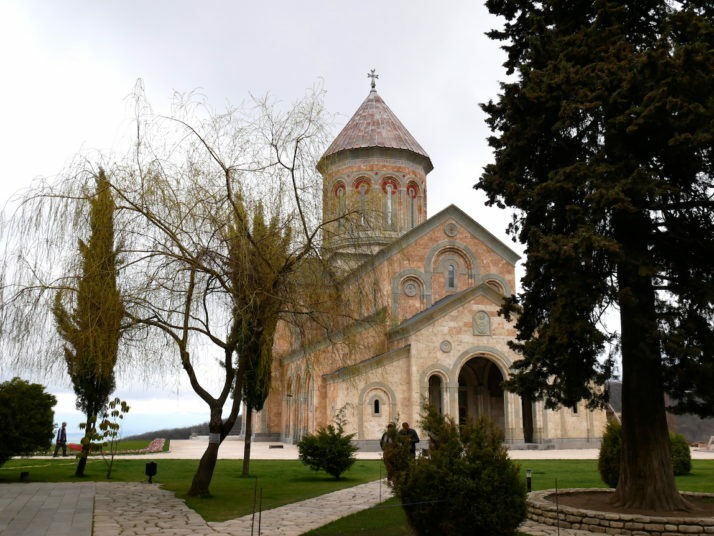 After our day trip to Mtskheta, we ventured a little further afield to the south eastern region of Kakheti which, as well as the following sites, is also famed for its wine. Enroute to our destination of Sighnaghi and straddling the border with Azerbaijan is the 6th century cave monastery of Davit Gareja. Using public transport to get out this way would have doubled the time we needed, so we took the easy option and hired a guide-taxi through our Tbilisi guesthouse. 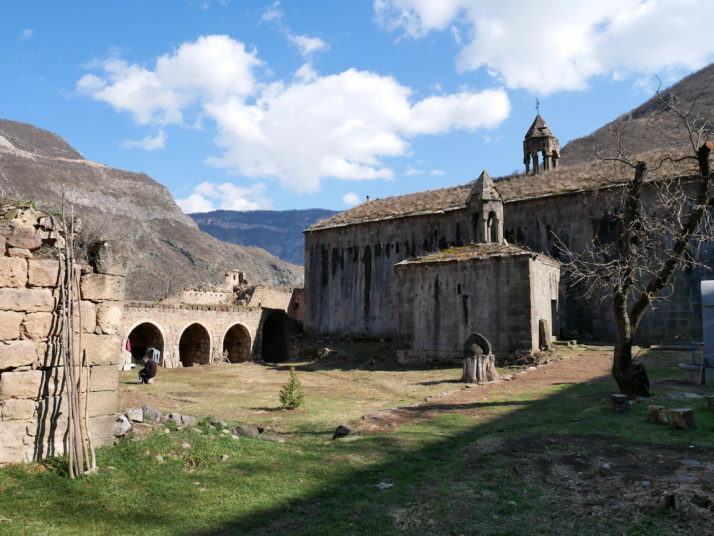 After a long 2 hour drive through increasingly bleak and sparsely populated land we arrived at the remote monastery of Davit Gareja, a relative oasis compared to the dry and treeless surroundings. Our guide Giorgi explained that as well as carving out their single-cell shelters, the monks used diagonal channels in the rock faces to collect the little rainwater the area gets. 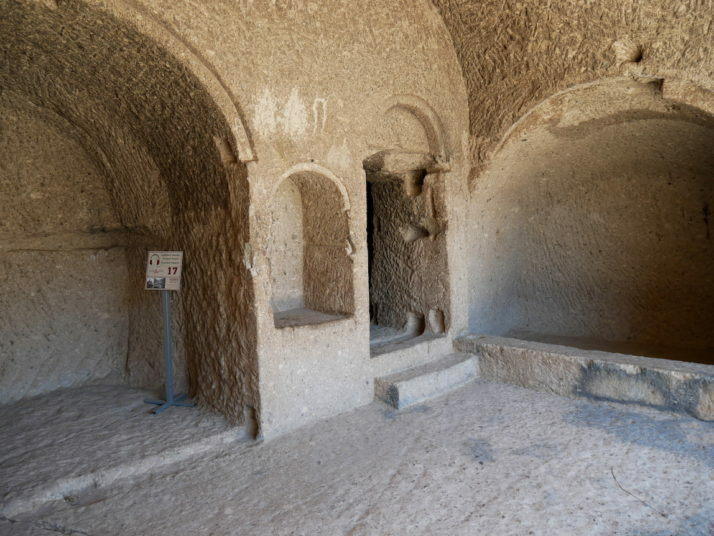 We were surprised to find much of this part of the complex is in use; the larger caves looked inhabited, some areas were cordoned off requesting visitors to kindly respect monk’s privacy, and there were about a half-dozen monks saying prayers in the small chapel which made it feel almost bustling. From the upper courtyard we took an energetic trail up through the monastery, past a few more basic caves and a couple of armed Georgian border guards to the top of the ridge before dropping a little way down the other side. 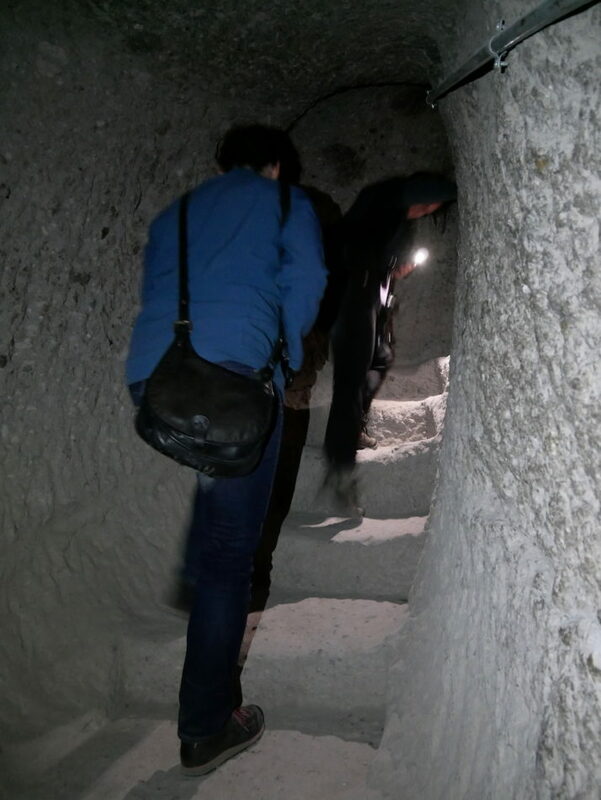 I wasn’t entirely sure why we’d left the monastery and were following a path that is essentially the border with Azerbaijan until we’d gone about 100 meters..
We spent a good hour or so working our way along the remains of the frescoed caves, many of which were just open to the elements. It was amazing how well they’d held up to the weather given a lot of walls had fallen away, but it was bittersweet that some Soviet visitors had scratched their names into the plaster. 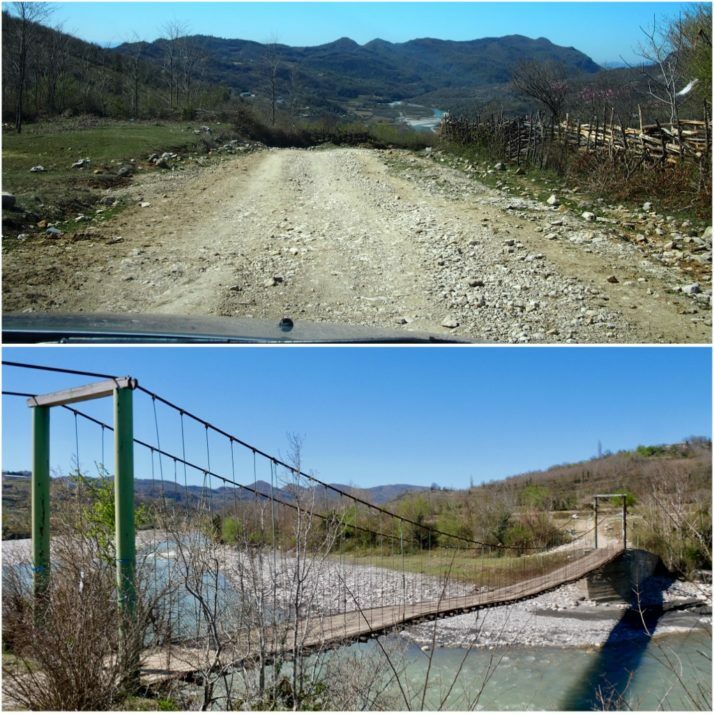 From Davit Gareja we drove another 2 hours to reach the outskirts of Sighnaghi. 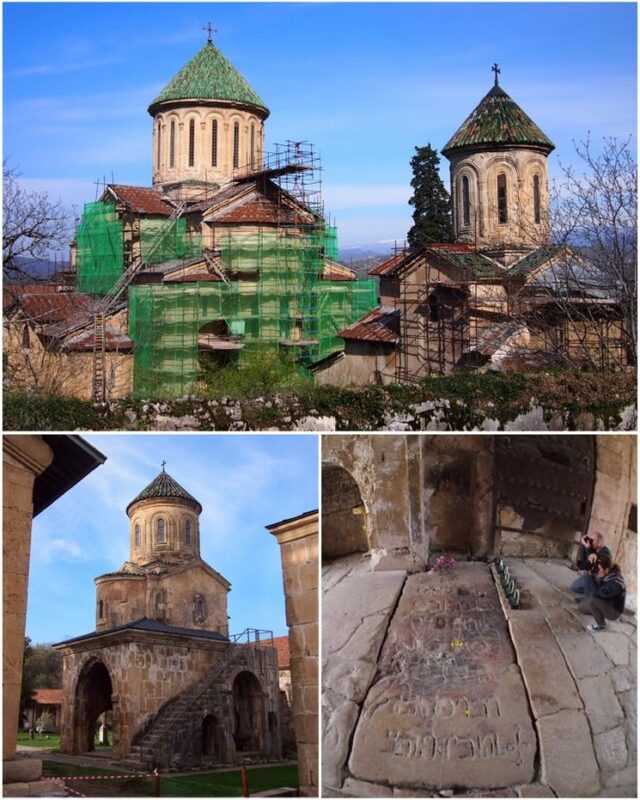 We’d planned to visit Bodbe Convent the following day, but as Giorgi and our fellow tourist Daniel were due to head back to Tbilisi the same day it made sense to include this small but important site in the itinerary. 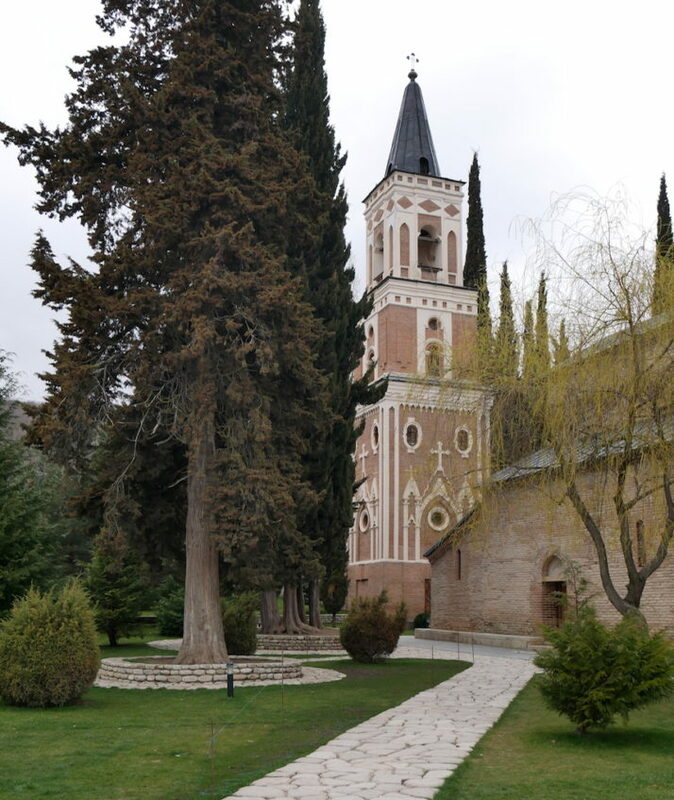 Set amongst tall cypress trees and lush, immaculately kept grounds, the peaceful Bodbe Convent is the final resting place of St. Nino, who converted the King and ultimately Georgia to Christianity. Our base for a couple of nights was Signhaghi, a laid-back, quiet, picturesque hill-top town ringed by a turret studded wall. 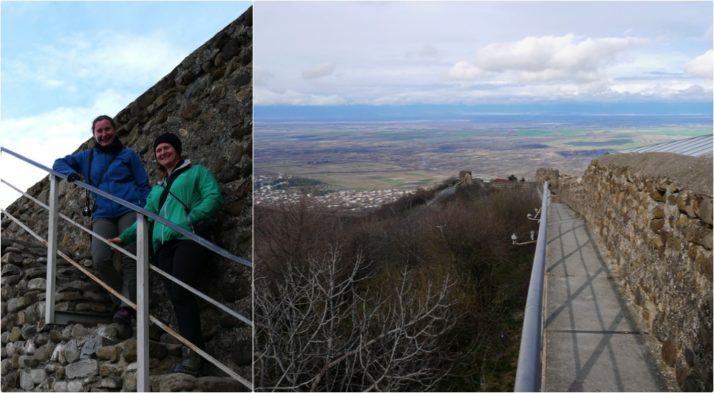 Given that we’d already done our day’s sightseeing activity before we’d arrived, we took a leisurely wander around the town’s walls which afford spectacular views of the wine growing Alazani valley and Caucasus mountains beyond (when there aren’t clouds in the way!). After a lazy day of wandering around in the morning and catching up with photos and diary writing in the afternoon we spent the evening indulging in great food and very good, very local wine! 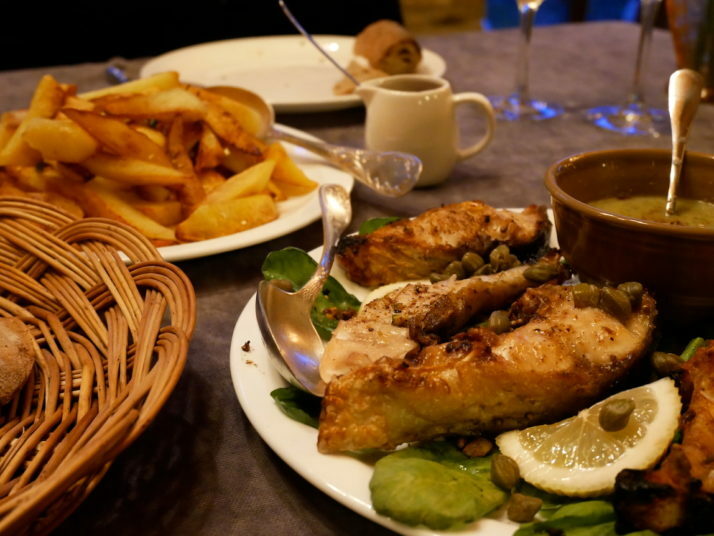 The food we had in Sighnaghi deserves a mention too – we unconsciously ordered fish and chips with our wine tasting – how does the saying go? you can take the British out of Britain.. 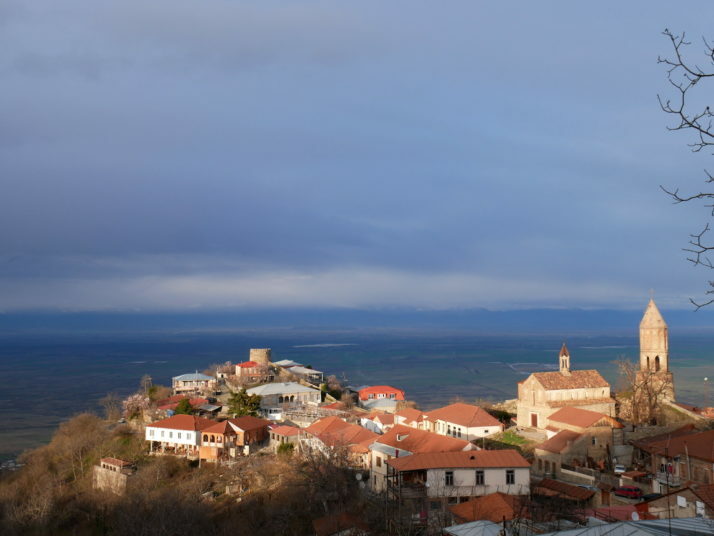 The Kakheti region makes up about 60% of Georgia’s vineyards and has been a wine producing area for over 8,000 years. 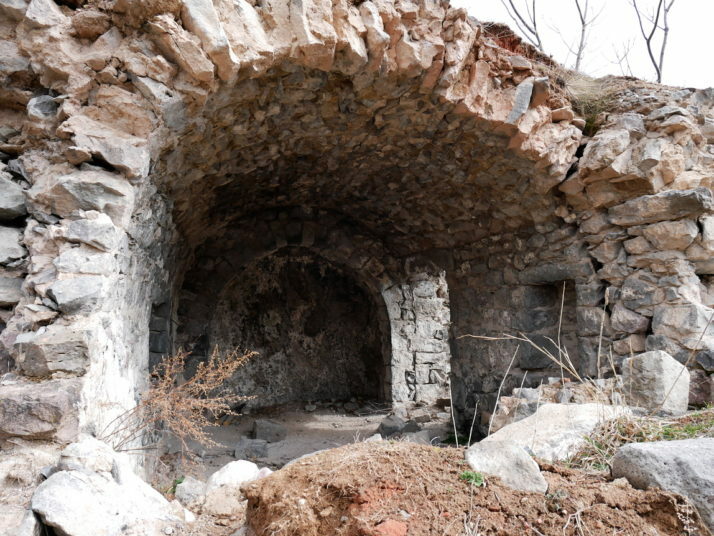 To this day the Georgians take enormous pride in their traditional method of natural fermentation in large clay pots called qvevri sunken into the ground. 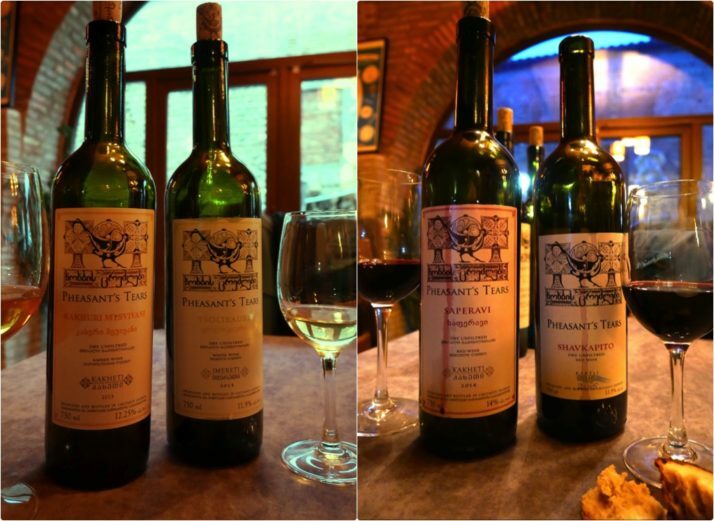 They also use the whole grape – skin and pips – which turns their white wines a rich sunset amber colour, though they’re still light and refreshing. Delicious! This entry was posted in Places and tagged Church, city walls, Food, Georgia, Monastery, Museum, Sighnaghi, Wine on May 15, 2017 by Andrew. 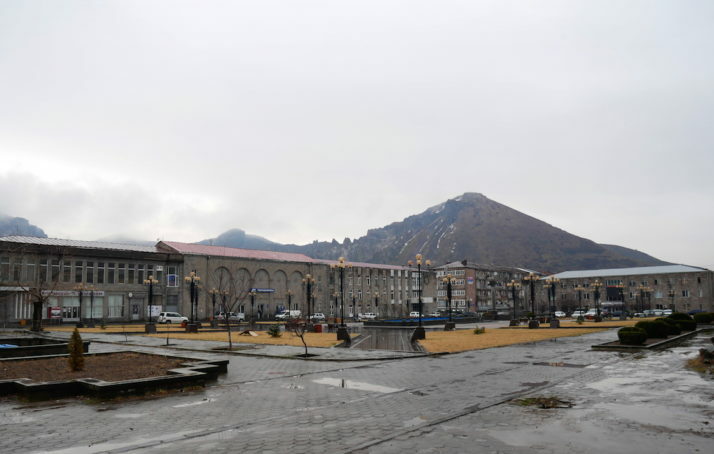 The southern-most destination of our Armenian road trip was the once prosperous industrial town of Goris, still quite bustling but very much past its heyday. The long main streets with their two-storey houses with large wooden balconies stretching out over the pavement contrast with the functional concrete Soviet-era municipal buildings and residential apartment blocks. Everything has a partially abandoned shabbiness to it that’s quite endearing. 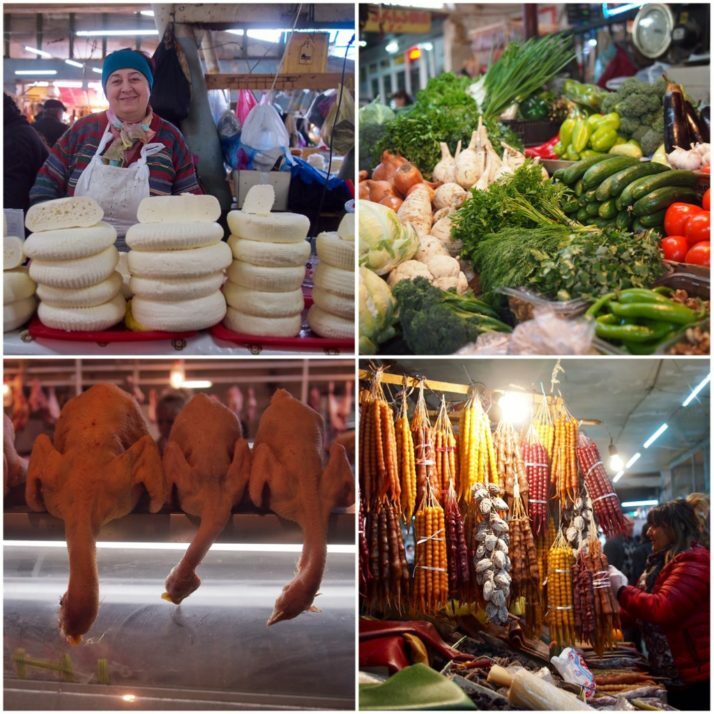 The main highway from Yerevan skirts the top of the town on its way to the Nagorno-Karabakh Republic and Iran further south (two more places to visit that we’ve added to our ever-expanding list! 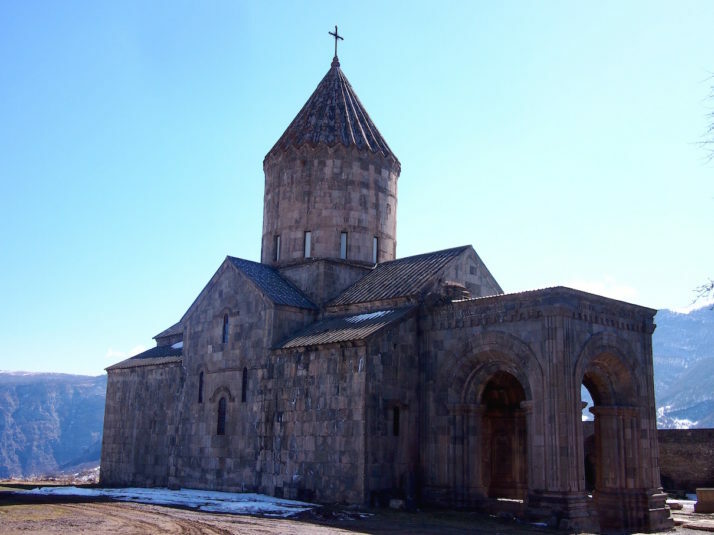 ), but our reason for stopping in Goris was the nearby sights of Tatev Monastery and the cave settlement of Khndzoresk. Another monastery? 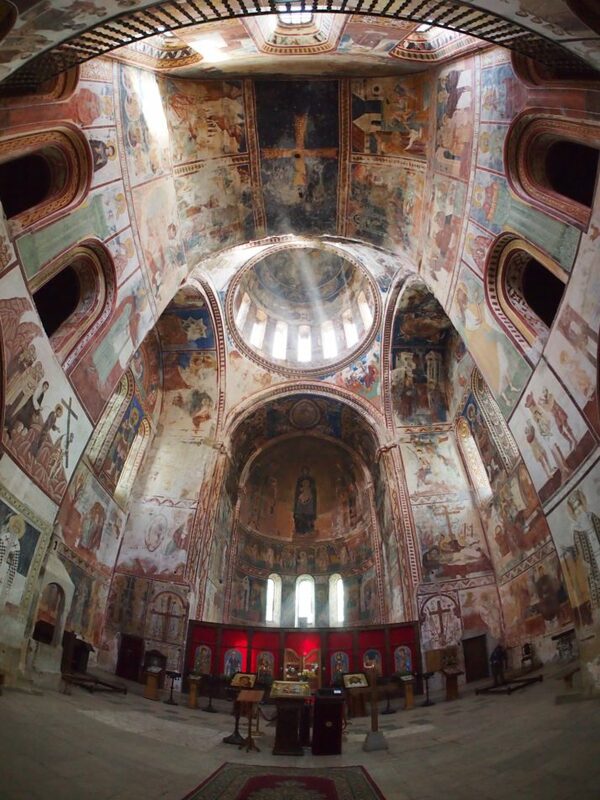 We weren’t kidding when we said we thought every other site might be a monastery or church! 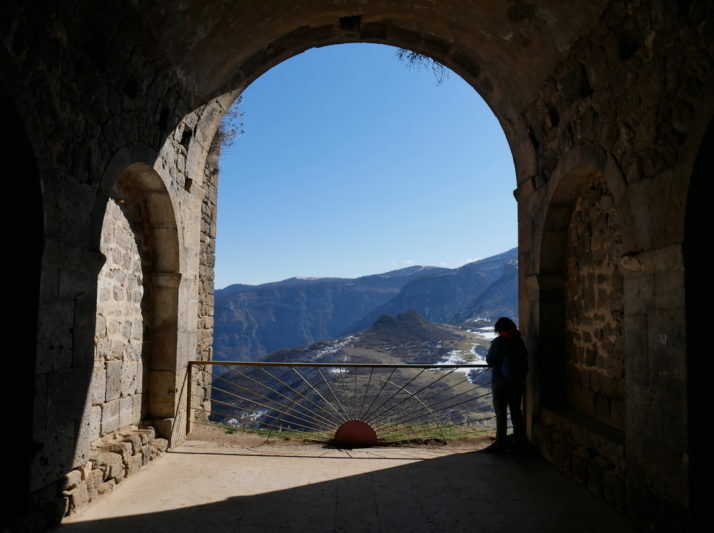 The journey to Tatev is a little more exciting than most as it involves a cable car. Somewhat ostentatiously called ‘The Wings of Tatev Aerial Tramway’, it’s in the Guinness Book of World Records as the longest non-stop double-track cable car – which makes it sound a lot more impressive that it actually is! 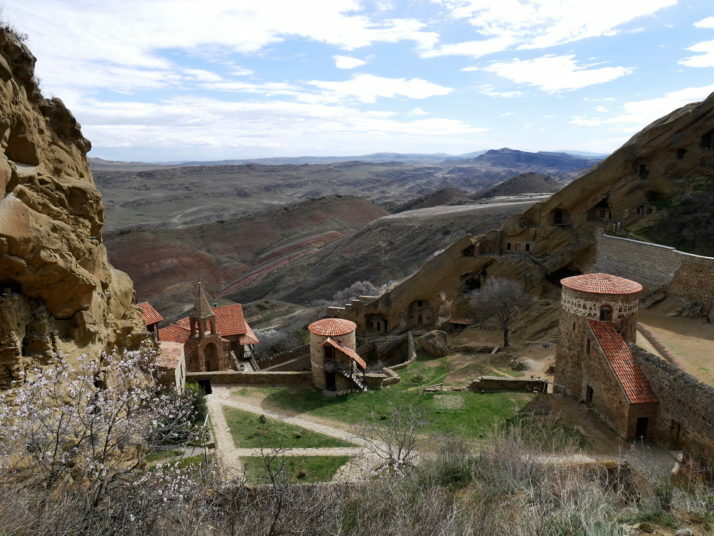 However, all is forgiven for the views over the small village of Halidzor, the remains of a warning bell tower and the spectacular view of the monastery itself, perched on the edge of the plateau. 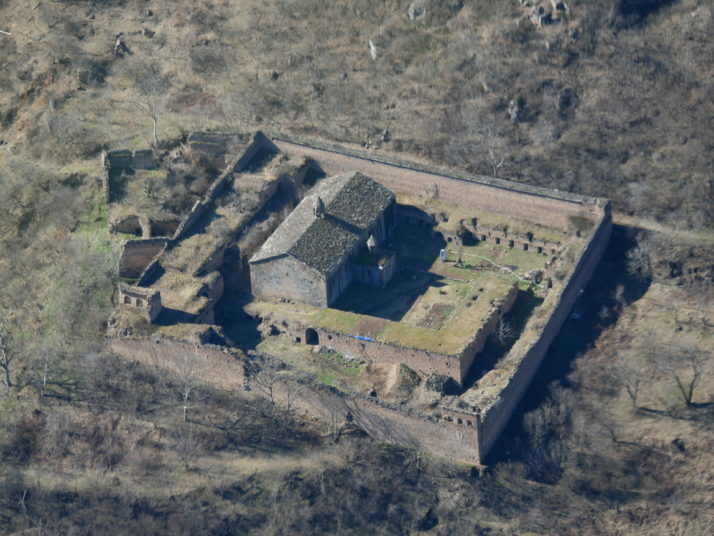 Although there was a small church on the site from the 4th century, Tatev grew into a thriving academic monastery after the main Surp Poghos-Petros (St Paul and St Peter) church was built in the 9th century to house important relics, and at its peak was home to some 1,000 clergy and students. I enjoyed exploring the old monk cells more than Julie did! 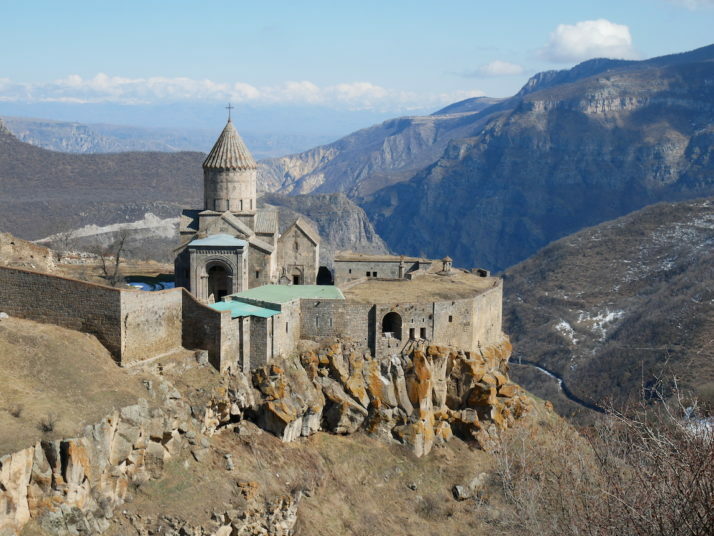 When we visited in March 2017 the restoration works were well underway and we read that the intention is to restore Tatev to a working monastic university which will include an interactive museum. 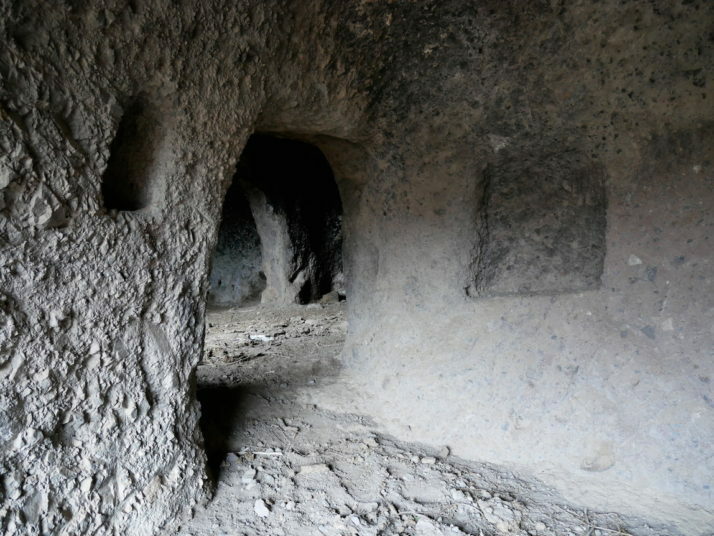 I hope it’ll still be possible to visit some of the monk’s cells in the outer walls that look down the valley as we enjoyed exploring the rabbit-warren of interconnected rooms. The view from the monk cells down the valley. Apparently there’s a tunnel carved into the hillside to the valley below! The other highlight of Tatev for us was the huge communal oil press sited just outside the monastery so the nearby villagers could use it without disturbing the monks. 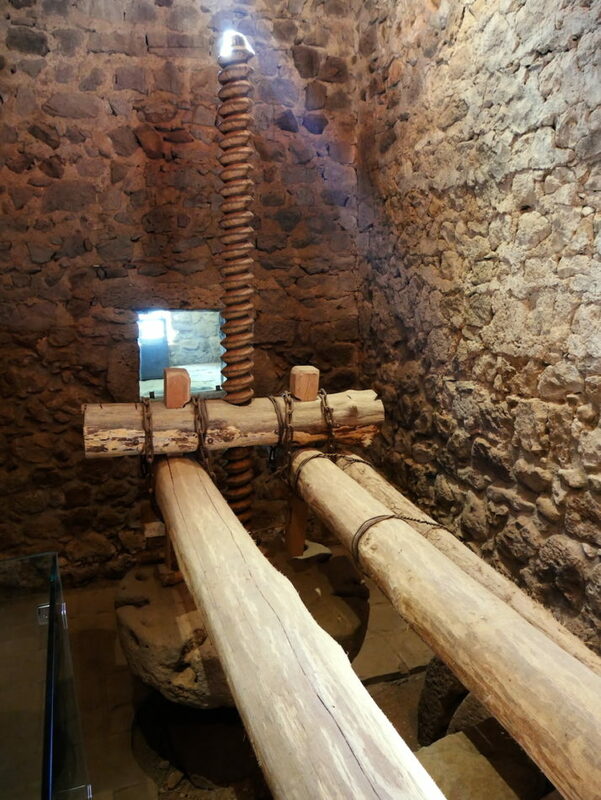 At first glance we thought the giant screw end did the pressing but a video showed us that we had it the wrong way round – the sacks of seeds sit under the other end of the long wooden beams, and the screw end is used to control the compression. 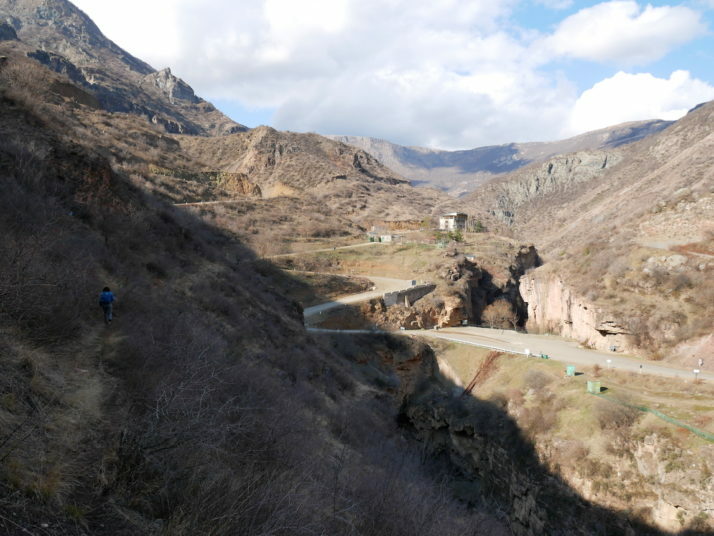 Having taken the cable car to Tatev we decided to hike the 9 miles (15km) back which meant we could visit Tatevi Mets Anapat (Tatev Hermitage) and the Devil’s Bridge both located in the valley below. 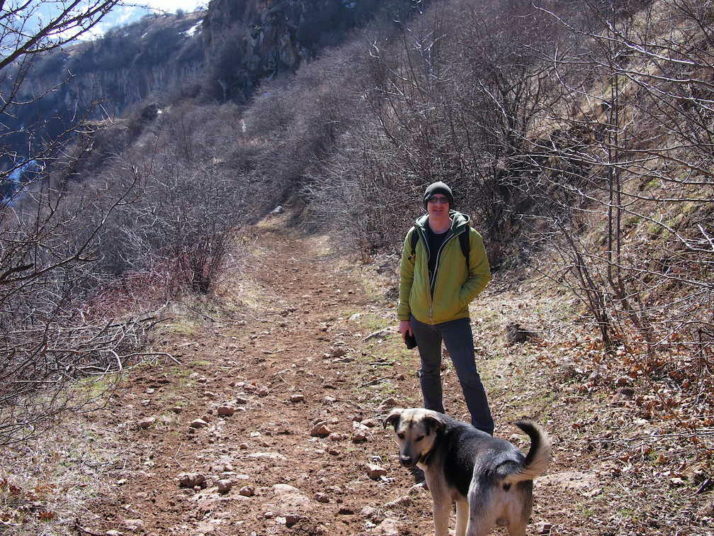 After a spot of lunch on the outskirts of Tatev village, we were adopted by our requisite tour guide dog whom we named Grigor and set off on the well trodden trail down the hillside. Concerned that we were running a little short of time to make it back to the car park before it closed at 6pm, we gave ourselves 20 minutes to poke around the ruined hermitage of Tatev and that was plenty of time, though I still couldn’t find the tunnel that apparently links it with the monastery we’d hiked from! 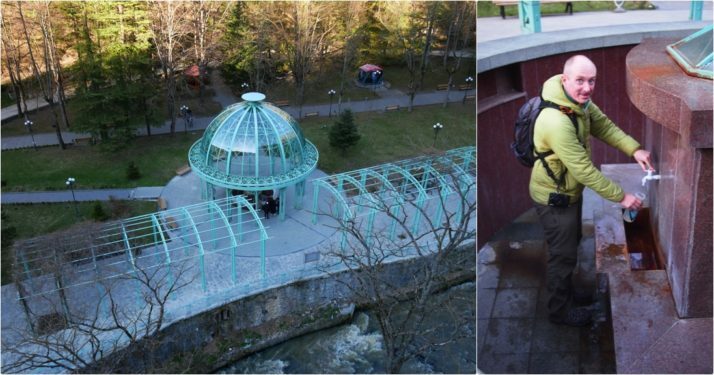 Filling up our water bottles from the natural spring at the Devil’s Bridge gave us two surprises: firstly, the tepid sulphuric taste was a bit of a shock to our hiker’s thirst and we were re-united with Grigor! He’d gone walkabout as we’d left him outside while we were in the hermitage and he was delighted as only dogs can be when they see you again! By now it was getting on for 4pm and we were both getting a little anxious about making it back in time to retrieve the hire car. We had 2 hours to hike 6 miles (9km) up the switchback valley road which was doable, but it would be close! After about 3 quarters of an hour we spotted some cars going our way and we were able to flag one of them down. As we set off with the 2 reserved Armenians in the front of their luxurious 4×4 we realised how far 6 miles is and were very thankful they had stopped for us! 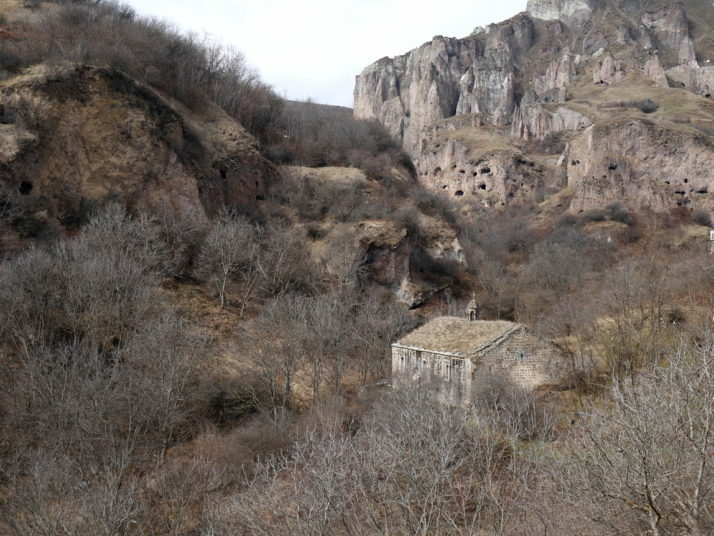 Old Khndzoresk is a large abandoned village of cave dwellings cut into the steep valley walls. The information board at the entrance said that at its peak in the early 20th century it comprised 9 districts, 1800 homes, 7 schools, shops, and workshops. We reckoned that meant the population would have been over 7,000! 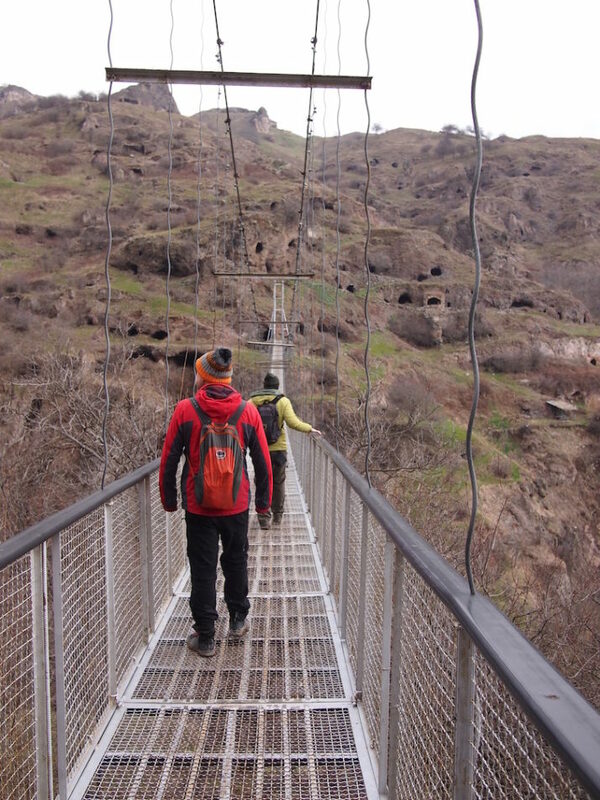 The caves are reached by a 160 metre suspension bridge that was hand-made by the locals to encourage tourism. They’re very proud that no heavy machinery was used! 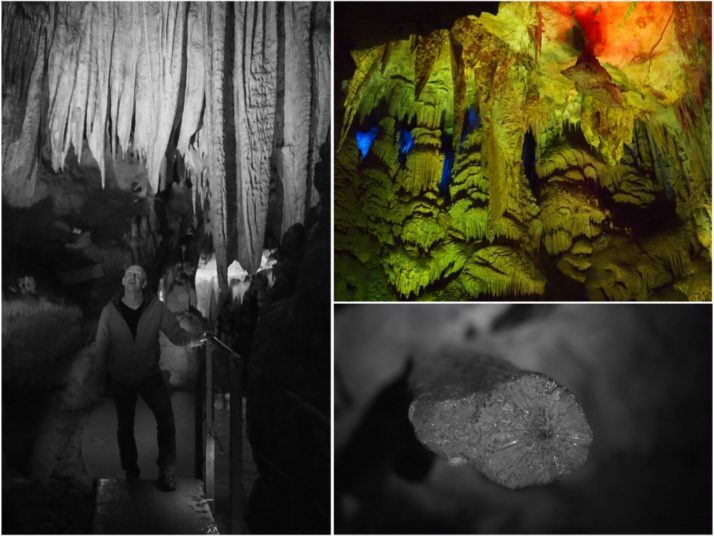 We took a little picnic with us and really enjoyed spending the day exploring the caves. 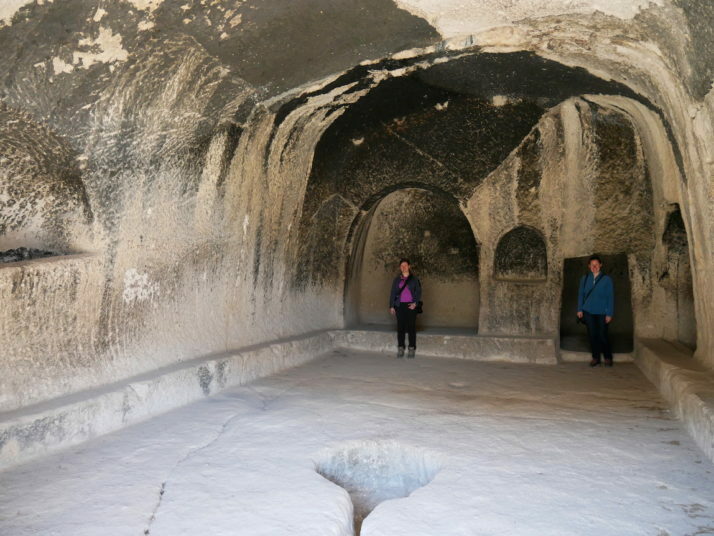 This entry was posted in Places and tagged Armenia, Cave, Church, Goris, Hiking, Monastery on April 24, 2017 by Andrew.